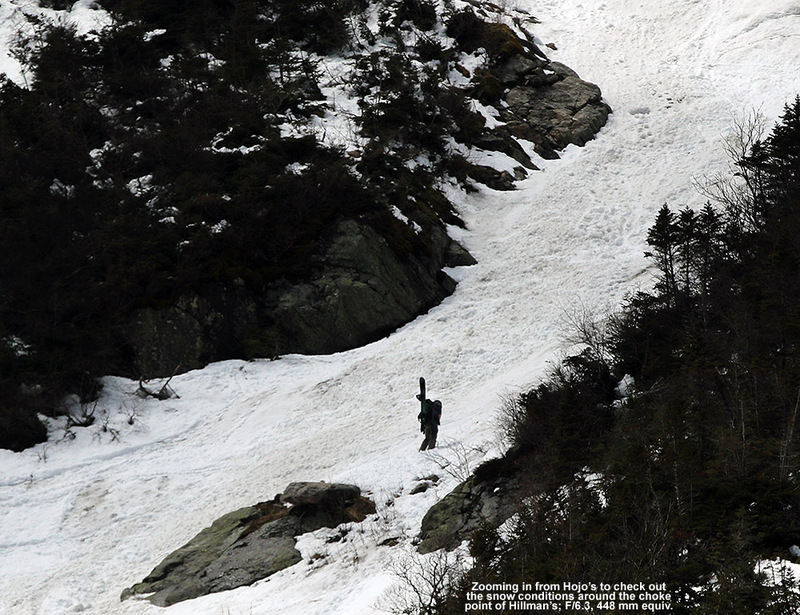 As the spring semester winds down, many of our graduating biochemistry majors here at UVM have been getting out to enjoy the remaining snow in the mountains of both New Hampshire and Vermont. 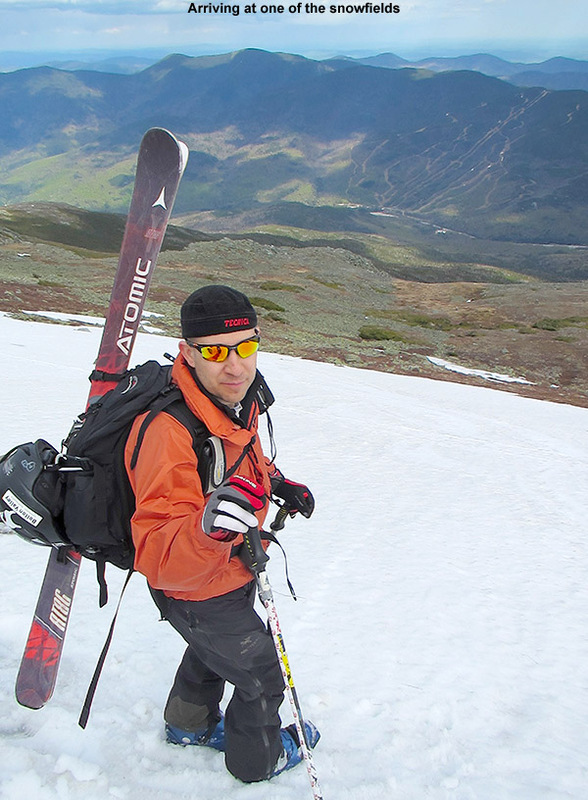 I’ve been hearing some fun reports, so when Rob invited me to join one of their Mt Washington adventures, I was definitely interested. His plan was for the Tuesday of senior week, weather permitting of course. My schedule looked good, so I was hopeful for the chance to commune with some of the seniors in the great outdoors before they’d begin departing after graduation. 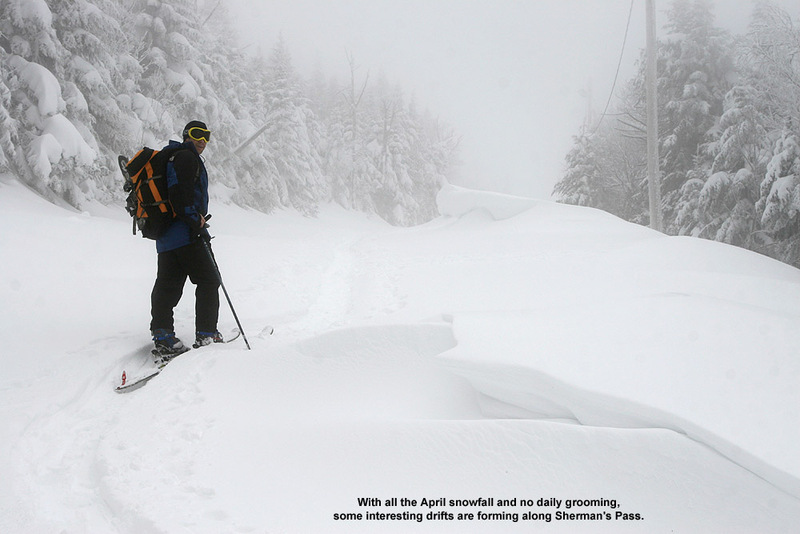 Mother Nature threw some rather interesting weather into the mix ahead of the planned trip, with Mt Washington picking up almost 3 feet of new snow at summit elevations over the past couple of days, and over a foot down at Hermit Lake. That was a lot of new snow, and the avalanche report suggest that northerly winds would be loading the more southerly-facing gullies and cross-loading the east-facing ones. Temperatures were expected to rise significantly today, which we knew would result in plenty of settling depending on elevation. There seemed to be enough potential to find at least some level of safe skiing, so we decided that we’d check with the staff on scene in the Hermit Lake area, and the trip was on. Meltwater pours from a gutter at the Hermit Lake Caretaker’s Cabin as rising temperatures melt off the recent snow. Only Rob and Emily ended up being able to make the trip, but I met them at the Pinkham Notch Visitor’s Center, and after getting our gear together, we were on our way. I’ve hiked up to the Tuckerman Ravine area many times, but with the new snow I decided to try a gear setup that I’ve never used before. Instead of brining two pairs of boots (hiking boots and ski boots), I wanted to just wear my mid-weight Telemark boots for everything, hiking and skiing. It turns out that the setup worked great; my Garmont Gara boots have got rubber Vibram soles so they were plenty comfortable and pliable on the ascent through a lot of dry, rocky terrain. Ascending from Pinkham Notch at ~2,000’, we saw our first signs of snow at 2,650’, and at around 3,400’ the snow cover was continuous enough that I was able to start skinning there and made it right up to Hermit Lake. The new foot or so of snow had certainly helped with the potential for skinning – coverage would have been somewhat less continuous on that last part of the ascent without it. 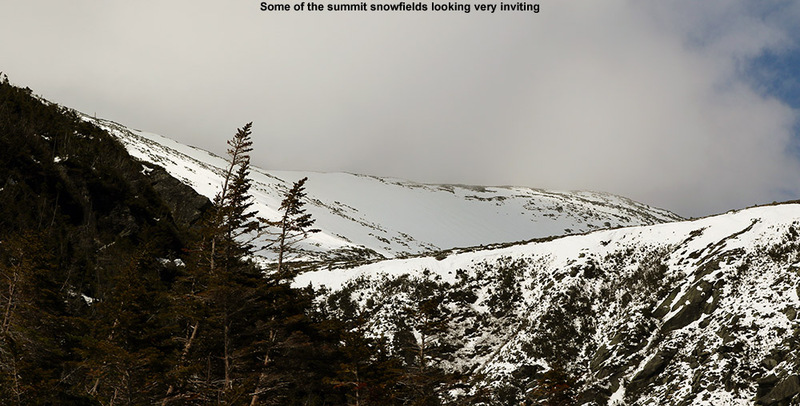 We assessed the snow/ski terrain situation from there, and while most of Hillman’s was visible with clouds just skimming the upper reaches, Tuckerman Ravine was generally socked in. After consulting with the staff at Hermit Lake, and using what we could see, we decided that Hillman’s Highway was the way to go. Most skiers we encountered seemed to be making the same decision. 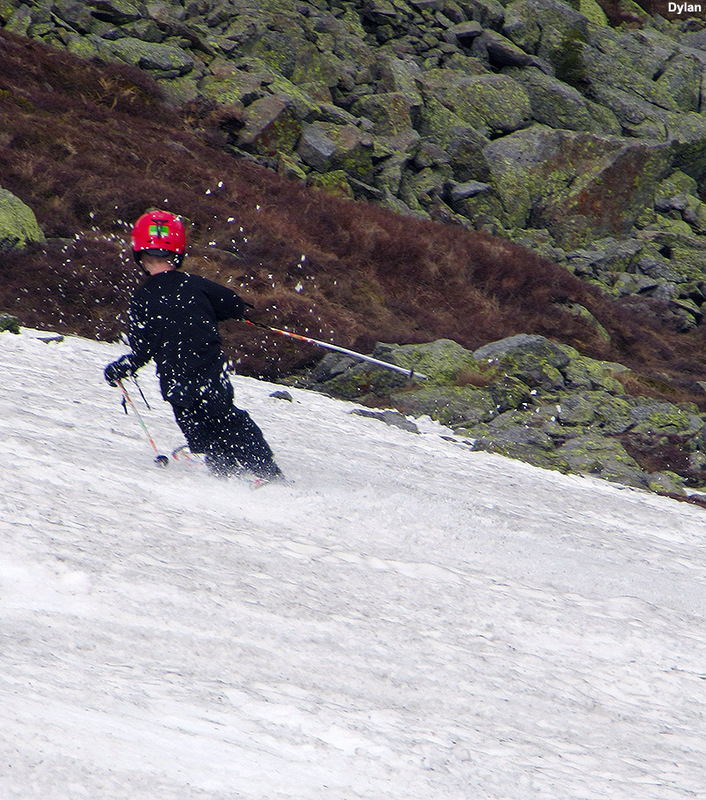 We could see that there had been some sloughing there due to the new snow, but the lower areas we could see looked quite settled and stable, and there had already been plenty of skier traffic in the gully. Emily and I skinned up the first part of gully, but around halfway it was just getting too steep and we had to switch to hiking. Thankfully there was a nice boot ladder already in place on climber’s right. I stopped around mid-gully where I figured I’d still get plenty of descent, and set myself in a good position with my camera. Emily and Rob headed up to where the gully splits into a Y, and went a little farther up the climber’s right option before settling down in a sheltered area of rocks. Above that point the snow hadn’t been skied and was a little questionable, and in that regard they were on the same page as other folks skiing in the area. 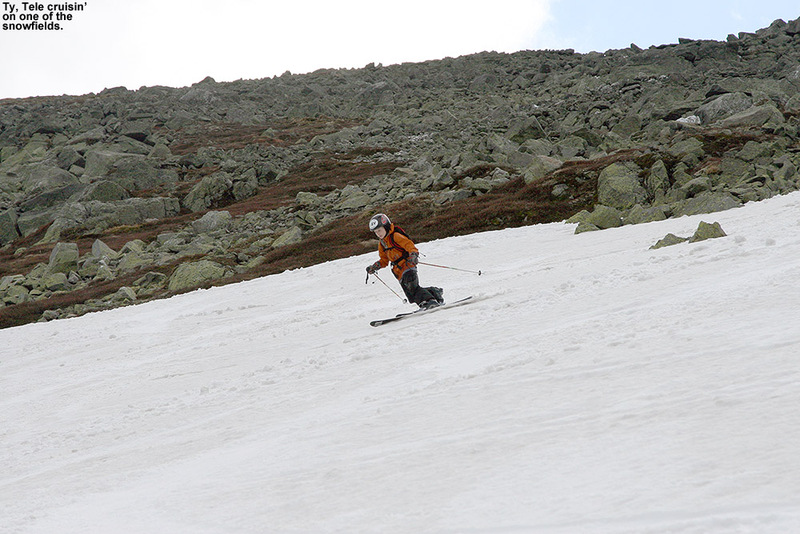 The best skiing was in areas where there had been some skier traffic that got down to the older corn snow surface, and the toughest turns were in the mush that had settled down near the bottom of the gully. 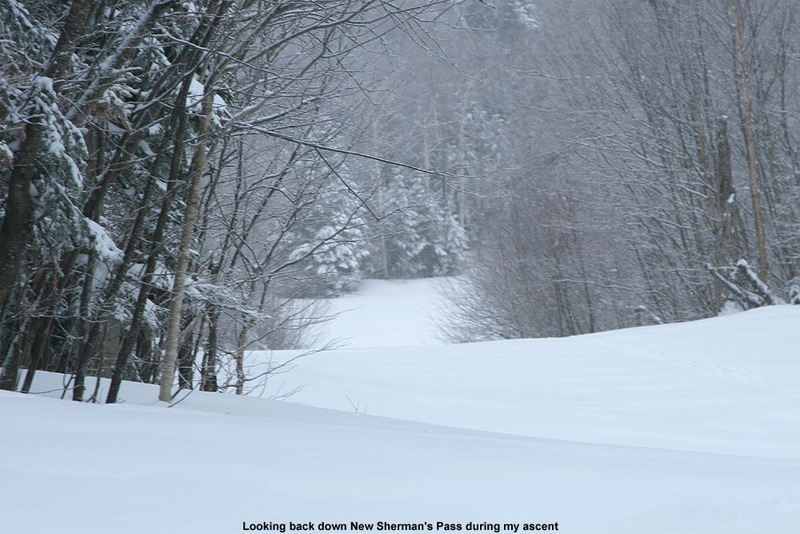 The Sherburne Ski Trail had actually opened back up a bit with the new snow, and we were able to ski about a third of it before we had to cut back to the hiking trail. After that the descent was quick, and we were back at the cars saying our goodbyes. The new snow is going to get even better with a couple of freeze-thaw cycles, and it’s certainly bolstered the snowpack somewhat in the higher elevations. Although they were in and out of the clouds, the summit snowfields looked really nice, so there should eventually be some excellent skiing up there with easy access as soon as the road opens back up. 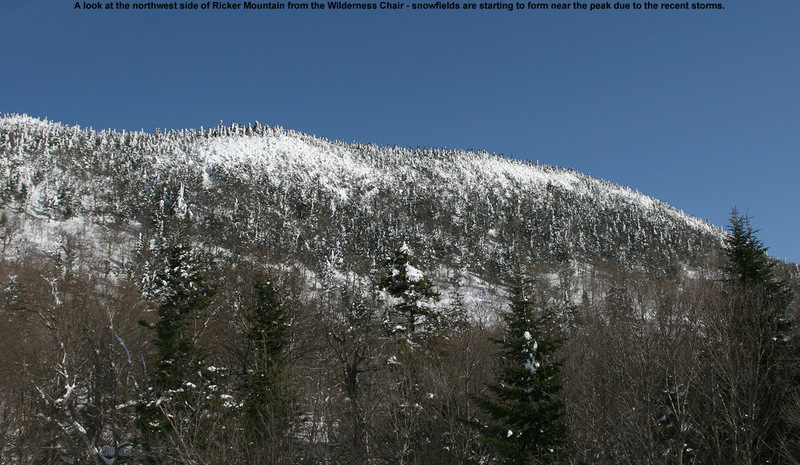 In the Northern New England thread at the American Weather forums this morning, there have been various reports and pictures of snow from the high peaks throughout the Northeastern U.S. 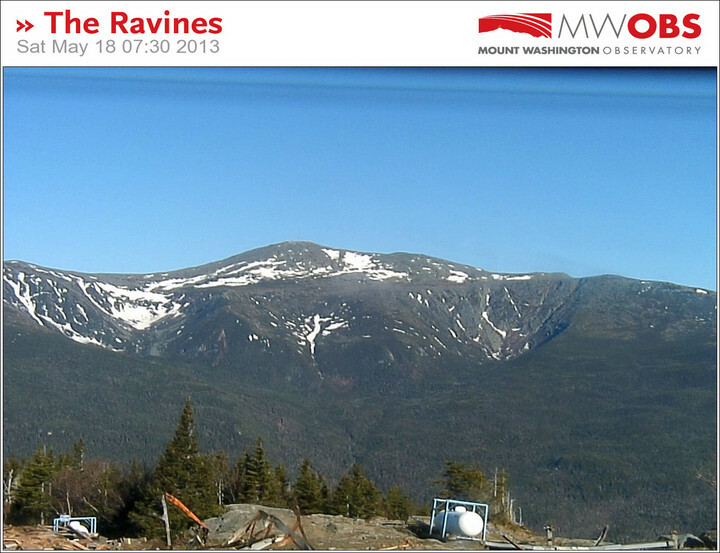 I saw pictures of frozen white from Sugarloaf Mountain in Maine, Mt Washington in New Hampshire, Mt. 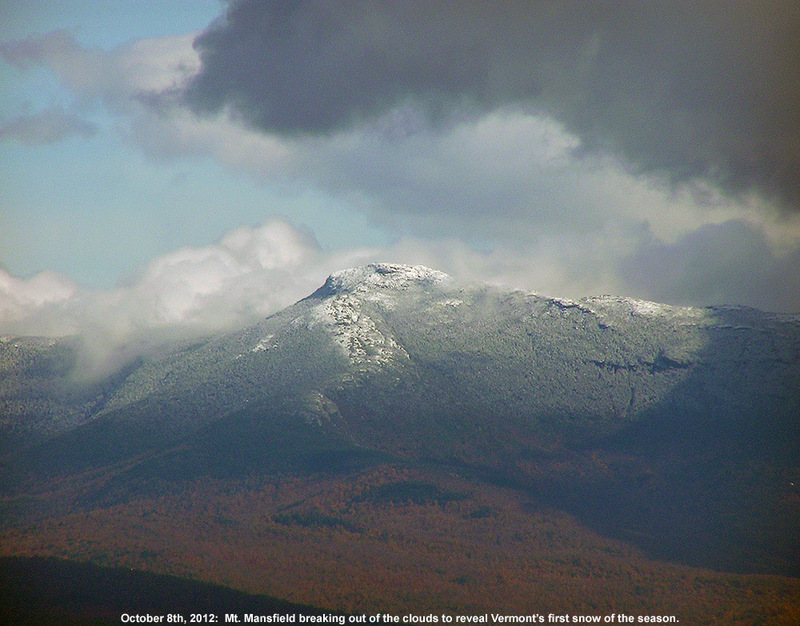 Mansfield in Vermont, and Whiteface Mountain over in New York. This is at least the second round of snow for some of the higher peaks, with hopefully more to come as we head through the fall. 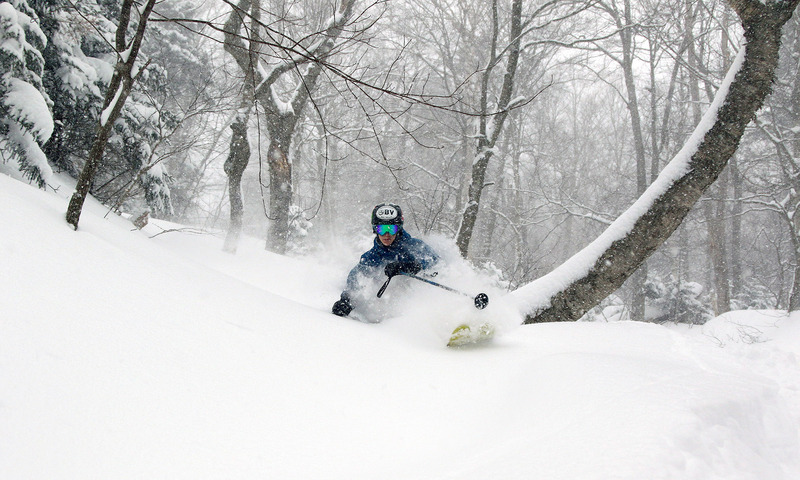 Head to the forum link at the beginning of the post to check out the images of this latest Northeast snow. 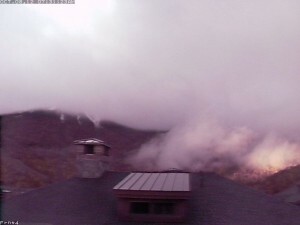 We’ve been hearing mentions of snow in the recent weather forecasts, mostly about how we’re getting close to those temperatures where the mountains can start to see flakes, and today I saw the first reports of snow up in the higher elevations. One of the engineers manning the broadcast equipment up on Mt. 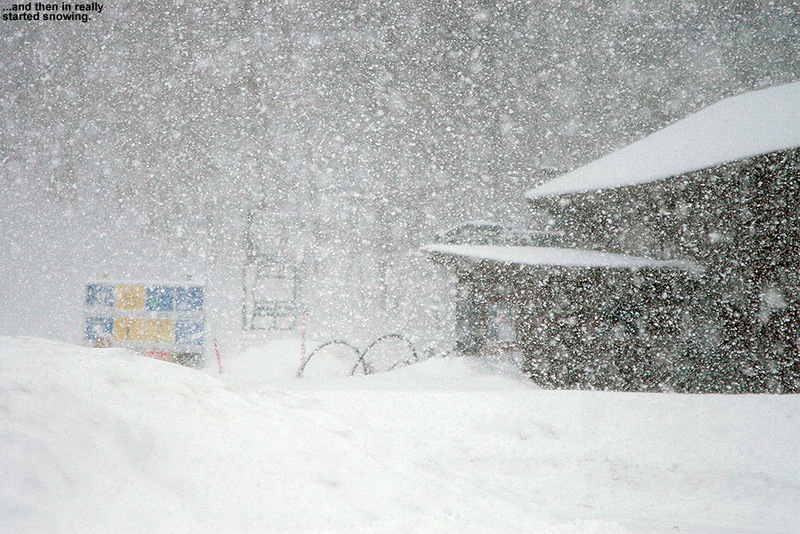 Mansfield snapped a picture of some of the flakes falling to document the first Vermont snow of the season. It’s not too surprising, with Mt. 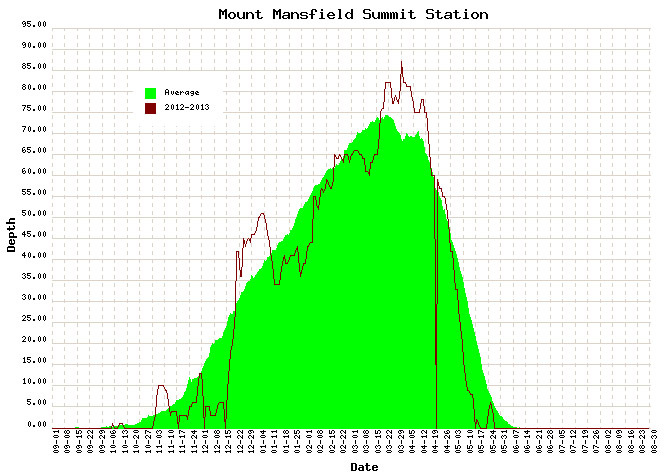 Mansfield close to the freezing mark this morning along the ridge line. A bit higher up, the summit of Mt. Washington in New Hampshire is sub freezing at this point. It’s October now, and although it looks like we’ll have plenty of nice weather coming over the next week, it’s the time of year when the mountains can start getting snow at any time, so we’ll be on the lookout for upcoming snow chances. 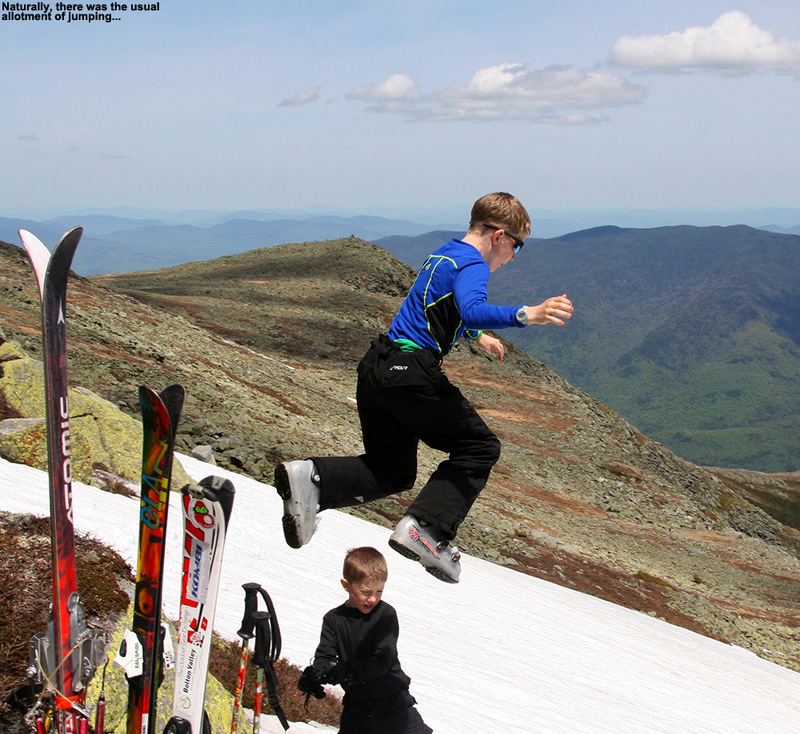 Since the end of the school year was keeping E rather busy last weekend, the boys and I just made a quick day trip out to ski the Mt Washington snowfields on Sunday. 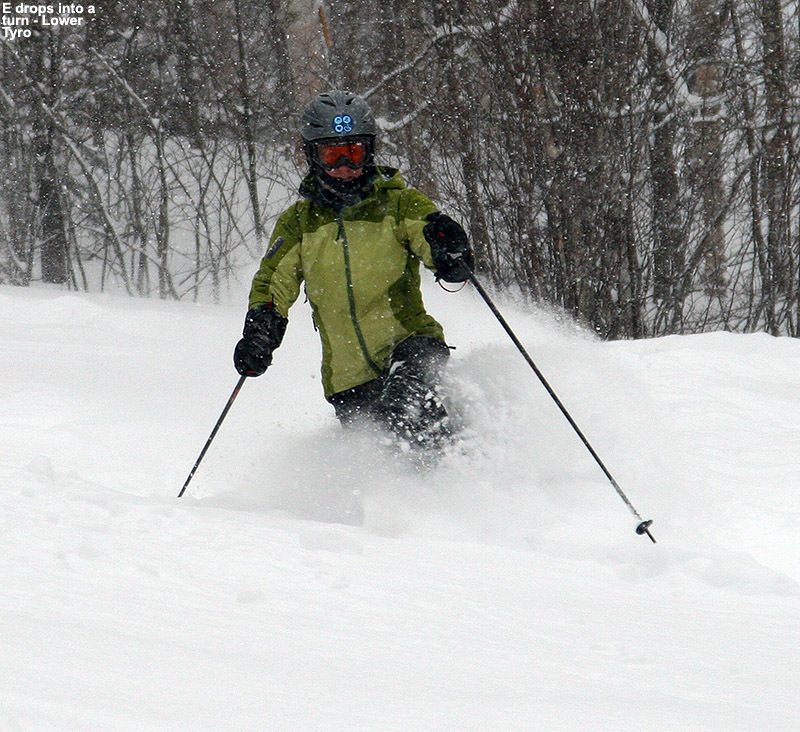 The turns were good, and with things lightening up for E by this weekend, we again kept our eyes on the weather for some possible camping and skiing. 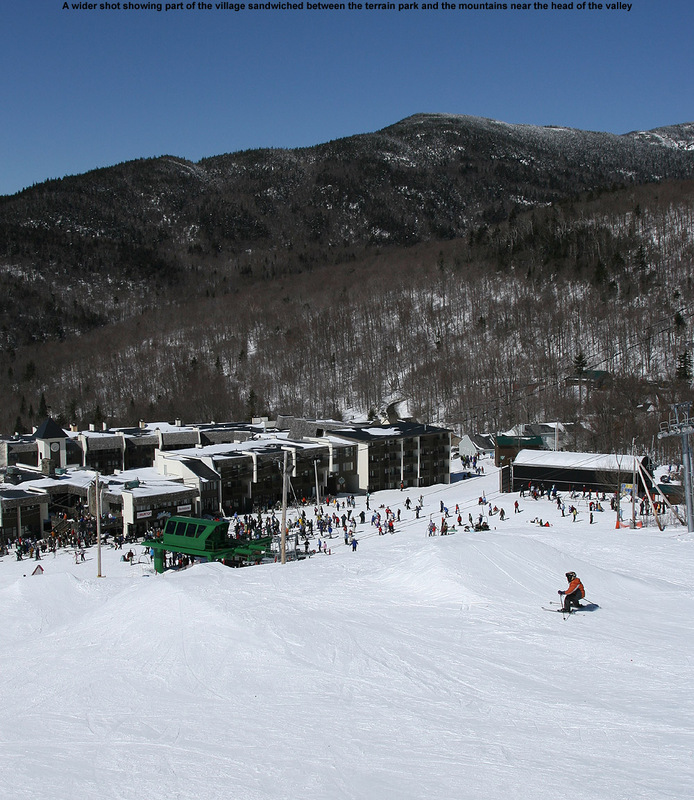 The forecast ultimately looked even better than it did for last weekend, suggesting warm, dry weather both Saturday and Sunday, so we packed up and headed off to New Hampshire yesterday around midday. 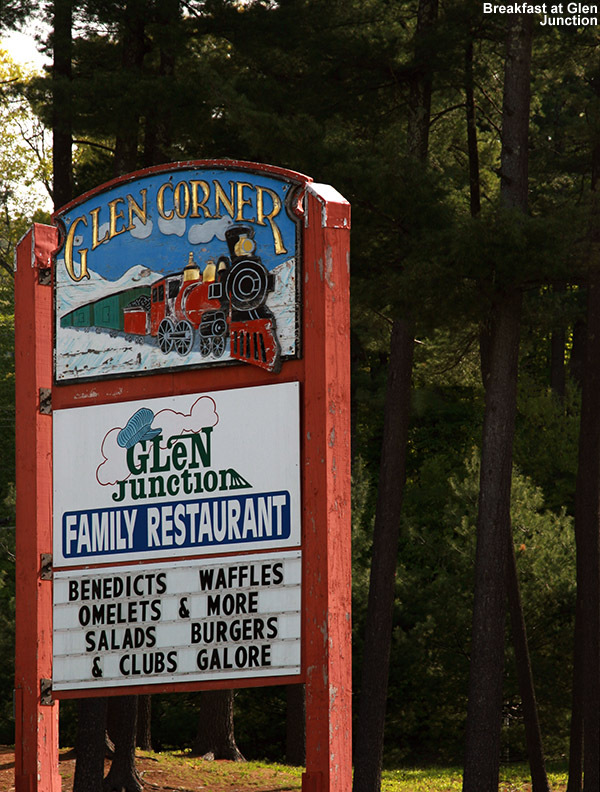 We set a course for the Glen, NH area to see if we could get a site at the Glen Ellis Family Campground similar to what we’d had last spring. 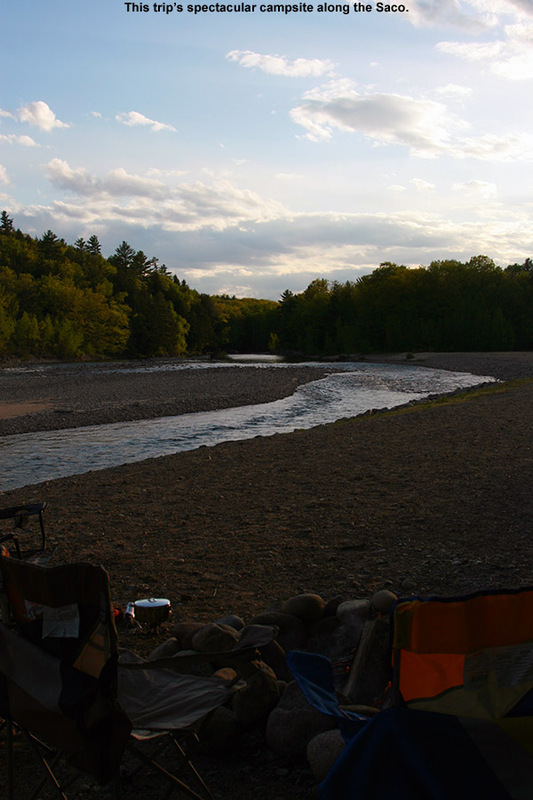 We’d never been to the campground before that trip, but we really liked the riverside campsite we had along the beautiful Saco River. Since the Sunday forecast looked even a bit better than Saturday with respect to the potential for clouds and wind, we headed right to the campground yesterday and found that they had a number of the riverside campsites available, even ones with electrical power, which we find great for charging up various mobile devices. 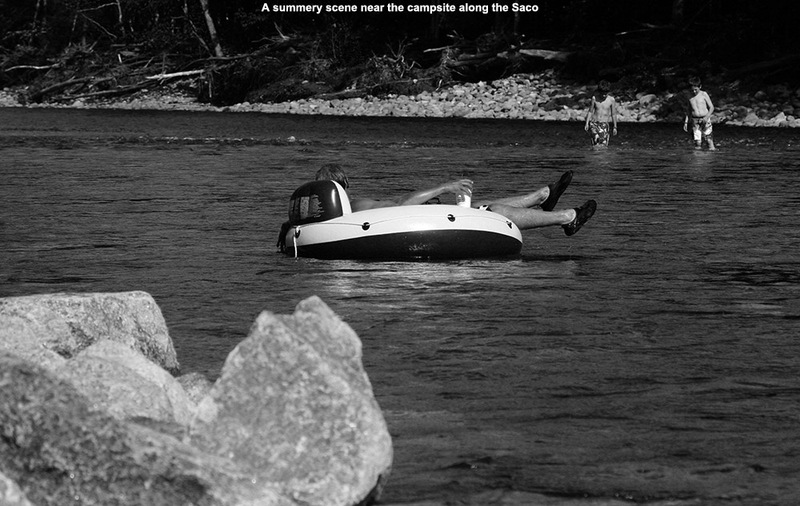 It was a warm afternoon in the 80s F, and tubing on the river was a popular activity. They’ve really got a great setup there for running laps in the river; you just ride down as far as you want, and walk your tube back up along the edge of the campground. We spent a chunk of the afternoon working on Dylan’s throws and playing some disc golf in the campground’s massive grassy fields, then had dinner at the campsite, and finished off the day with some evening exploration of the shoals and islands in the river. Dylan discovered that the campground had Wi-Fi, and we had an excellent signal even all the way out by the river, which is almost a half mile away from the main office. They must have an impressive wireless setup to be able to span the 65 acres of their campground. I did a test on Speedtest.net and found that the upload and download speeds were both 1.0 Mbps, which is plenty of bandwidth unless you need to stream video or do something similarly intensive. This morning we had breakfast, gradually broke down the campsite, and headed north on Route 16 for the quick trip to the Mt Washington Auto Road. 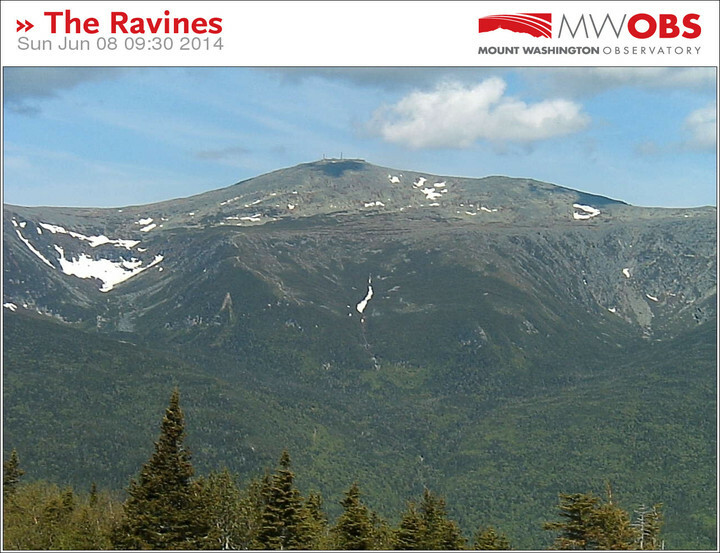 Thanks to the available Wi-Fi at the campsite, I was able to do a check on the Ravines Cam to see the current state of the snowfields. 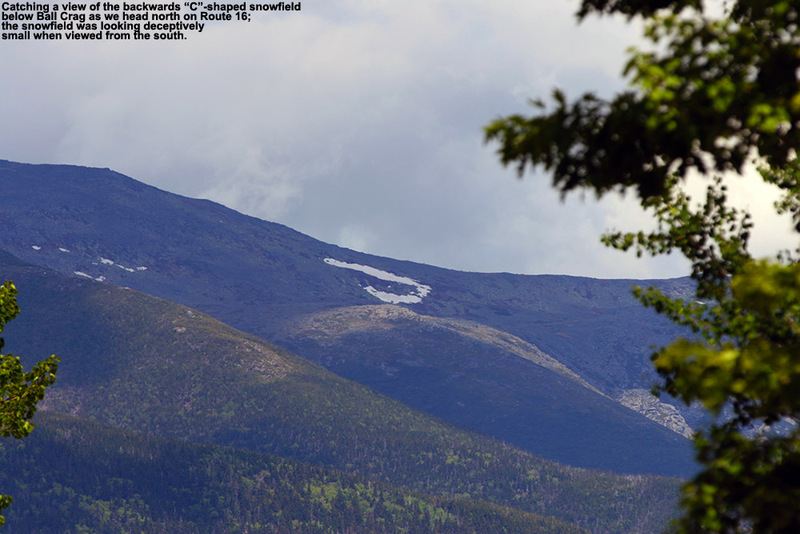 It was clear that the main Ball Crag Snowfield had lost a lot of snow in its middle sections, and the snow had the look of a backwards letter “C”. The main area of the East Snowfields had broken up a lot, such that largest remaining section didn’t seem to have much more vertical than what seemed available on the Ball Crag Snowfield. With that information and our knowledge from last week about the ease of access, we decided that the Ball Crag Snowfield area was still probably the best bet for today’s trip. After reading another trip report at the Time For Tuckerman Forum last week in which someone monitored their gas mileage up the Auto Road, we decided to monitor ours, and found that it was right around 9.0 MPG up to the 5,700’ parking area in the Subaru; since the other report indicated that they managed 10 MPG in a hybrid vehicle, and we were loaded with four passengers and lots of camping and ski gear, I guess that’s not too bad. Presumably there’s not much gained in a hybrid on a long, continuous climb like the Auto Road, but whatever vehicle it was, it’s likely to be a fuel efficient one anyway. 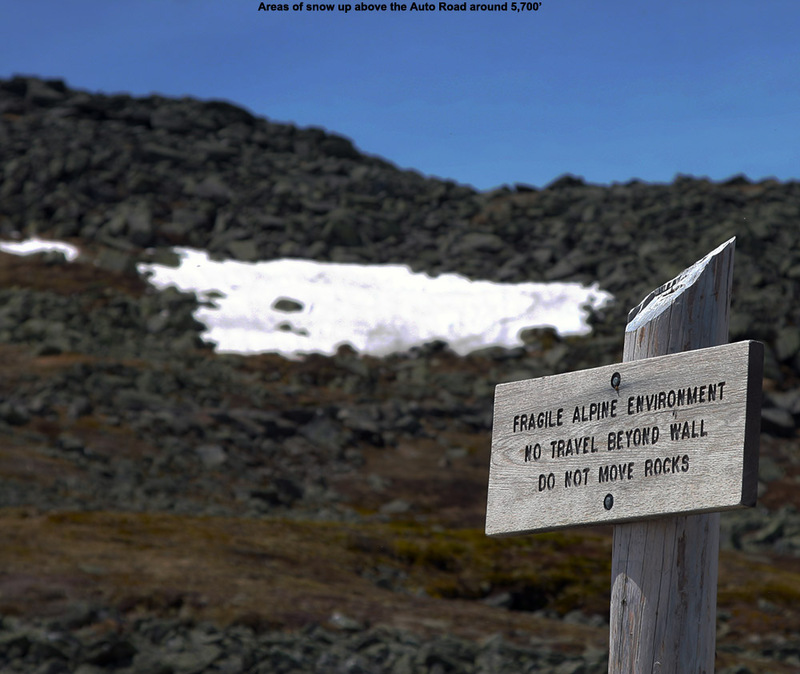 As we unloaded our gear, one of the Mt Washington Auto Road Coaches passed by, and the driver reminded us to make sure we stayed on the rocks so that we didn’t harm any of the fragile alpine flowers and other vegetation. I hadn’t seen much vegetation flowering last week, but he noted that some of the flowers were just starting to make their way up to these elevations now. It actually wasn’t as sunny as we thought it might be, and gray clouds almost looked like they might throw down some precipitation, so everyone packed light shells in their packs just in case. Being just a few minutes from the car, we find that one can pack minimally if they want to, but if rain really came down, we’d want to have something on hand. After missing last week, E was able to get out on the snow today. It was again a short trip to the snowfield, and we could start to get a sense for how what the ski options were going to be. Since last week, we could see that there hadn’t been too much change in the areal snow coverage in the upper section of the snowfield, but the lower section showed dramatic differences due to the past week’s melting. 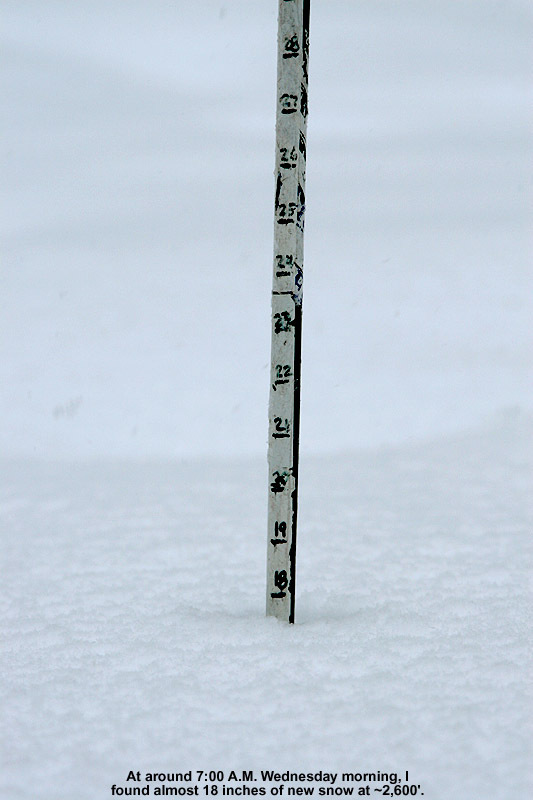 The lower section was much smaller, and the snow was no longer continuous into that area. That made laps in the upper section most practical, and Ty started banging out runs pretty quickly on that upper section because he really liked the short hike back up. 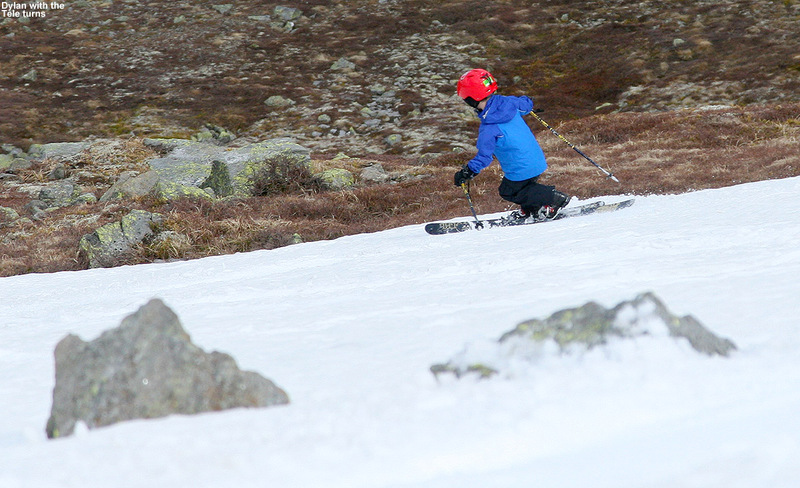 E slid out a bit on her first run and even got into the rocks at the bottom, but she was OK – it was definitely the most dramatic encounter with the rocks we’ve seen though, even more than when Dylan got into them a little bit last week. 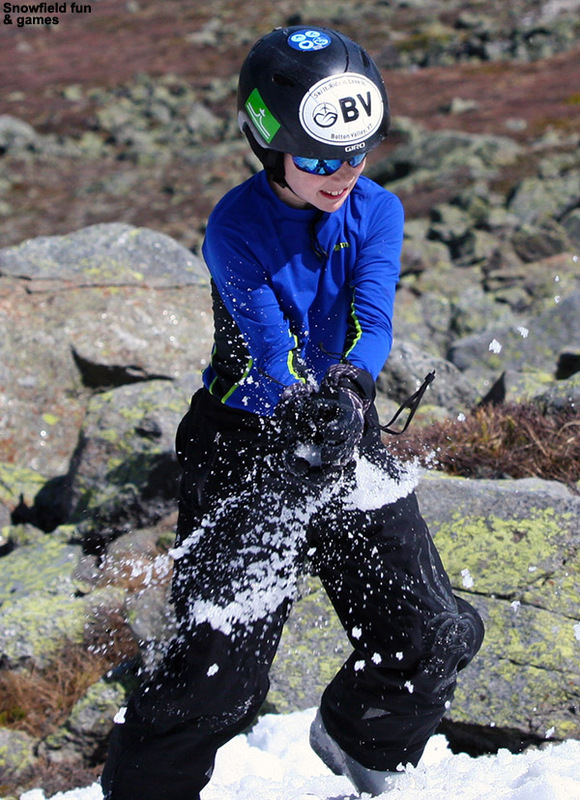 We often talk about how much we really need our helmets on these outings on the snowfields, since there are rarely other skiers around, but E’s slide was another great example of why we make sure to wear them. As she was sliding, even though she was in good shape being feet first, she was very happy to know that she had that helmet on. 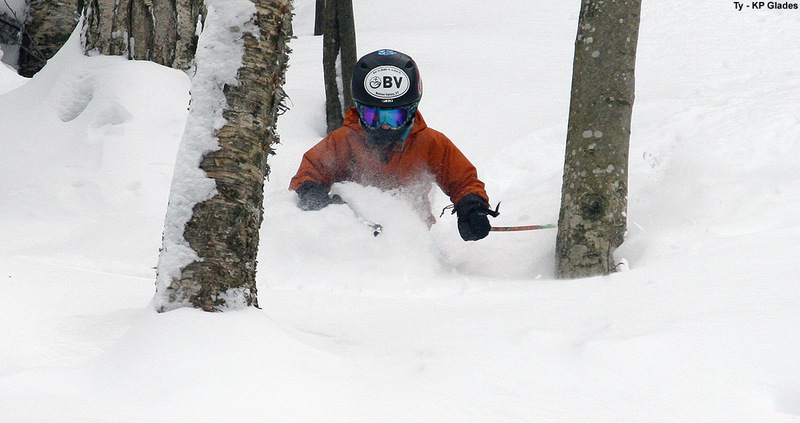 Ty kept cranking out the runs, and even Dylan whipped out a couple of quick runs before taking a break. I started to make some runs to see if I could catch up to Ty, but every time I’d take a run, he would do another with me, so there was no catching up that way. He was having fun with that, knowing that as long as he did a run every time I did, there was no way that I’d be able to catch up. It made for some fun runs where he worked on mirroring my turns, and although I couldn’t see him while we were skiing, now that I look at some of the photos, I can see he was doing a really nice job. 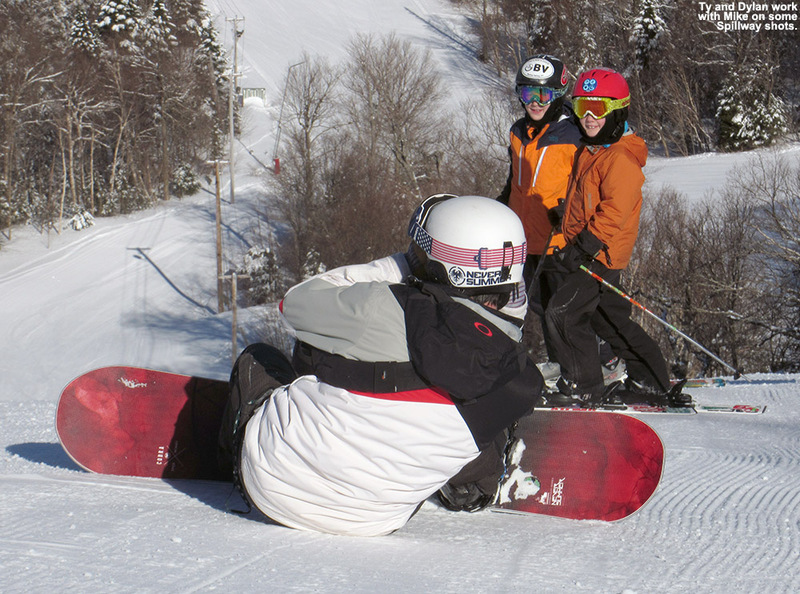 For our last run, Ty and I connected down to the lower snowfield for a few extra turns on our way to hike out, so in the end we called it an extra quarter run, so Ty wound up with 7 ¼ runs to my 4 ¼ runs, with Dylan at 3 runs and E at 2 runs. We joked with Ty that he didn’t even do as many runs as the rest of us, because before that last run, he was quite proud that he had! The sky remained with one and off gray and sometimes fluffier clouds, with the occasional break of sun, and fortunately there were no signs of any precipitation. The boys had wanted to head up to the summit of Mt Washington and visit the Sherman Adams Summit Building on our last outing, and we didn’t really have time, but this time we’d planned on it, so we stopped in at the visitor’s center for a while. We used our tickets to the new exhibit area in the museum, which is focused on the extreme nature of Mt Washington in the winter, and indeed it has been heavily updated relative to what was there before. The whole area seems very new and modernized all around, and there’s some impressive use of high-definition screens and other video technologies. It’s certainly worth a visit to the new exhibit if you have not seen it since it’s opening in May. 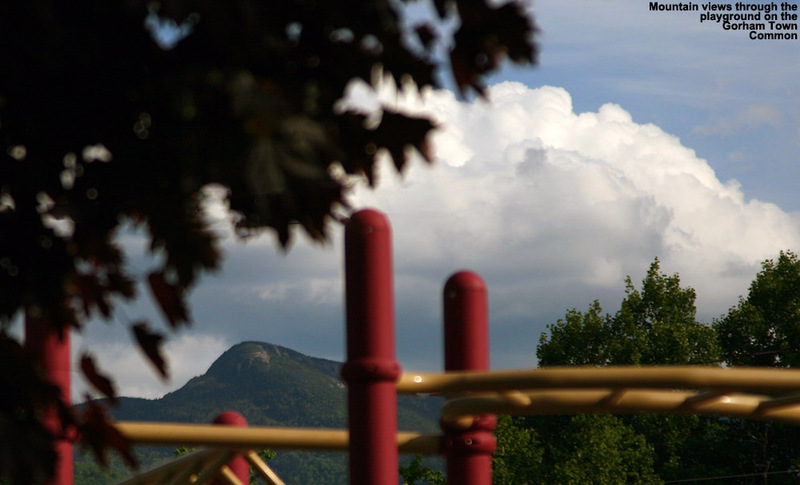 We stopped in Gorham for a bite on the way home, and ate at one of the picnic benches on the Gorham Town Common, where the boys hit the playground for a bit. 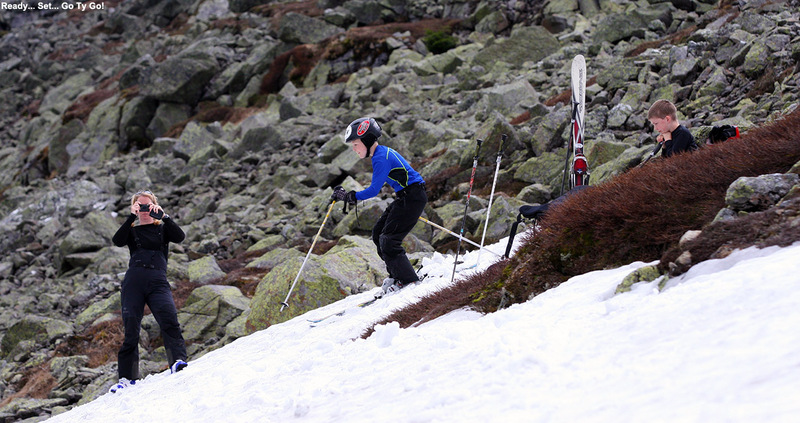 I’d say that’s just about it for the snowfields this season, so most of the activity will be shifting to Tuckerman Ravine. 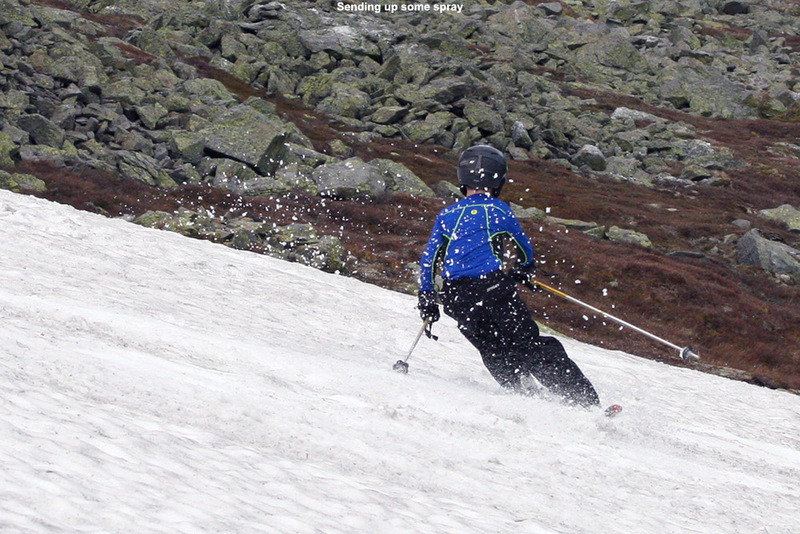 For some strange reason, the availability of snow only seems to decrease this time of year! Last weekend’s weather was a bit too dicey to get us to head over to Mt. 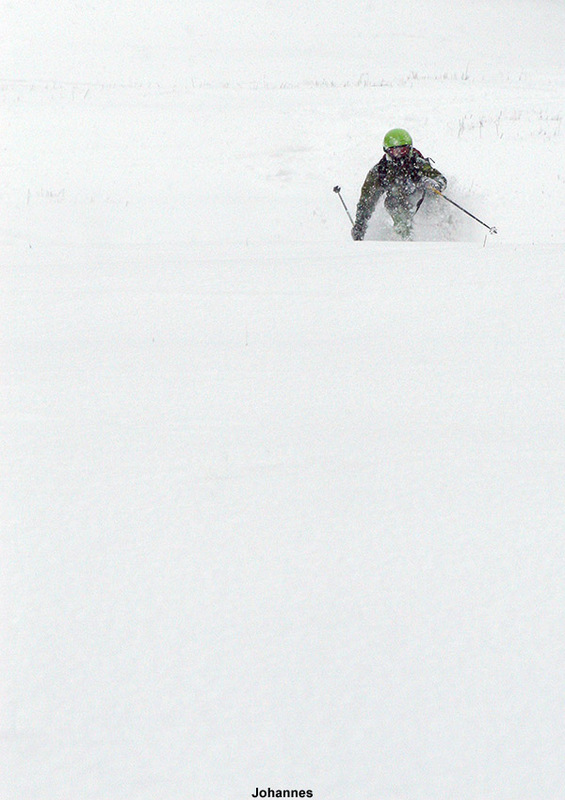 Washington for skiing, but the forecast for good weather this weekend was looking pretty solid. E was feeling the need to get other work done with the end of the school year closing in, so the boys and I decided to just go for a day trip to the snowfields. 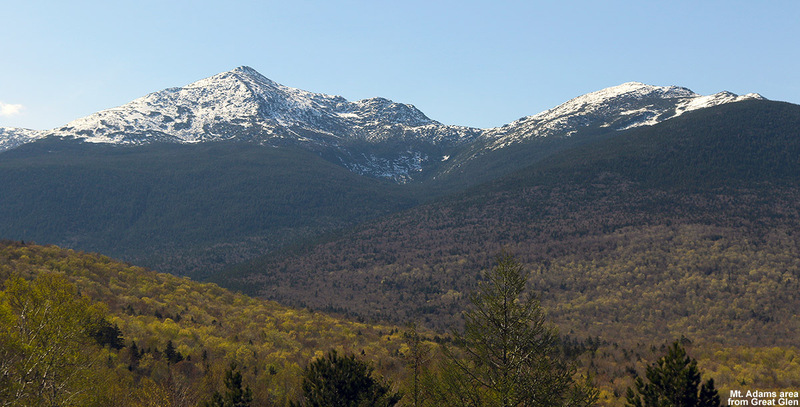 Typically we throw in some camping in the White Mountains as part of our Mt. 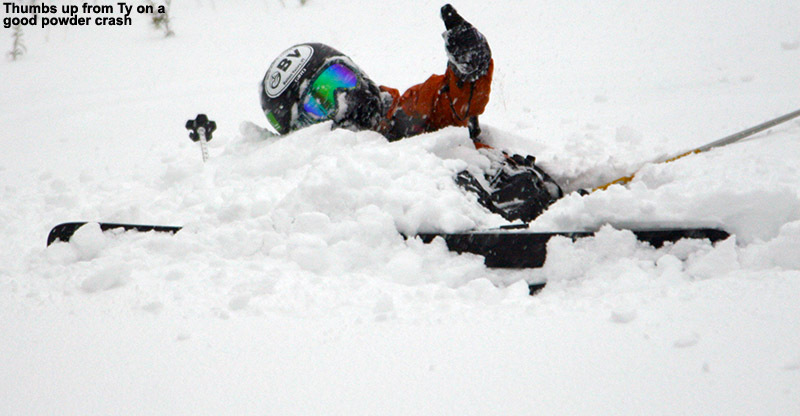 Washington ski trips, so this would be the first time in a while that we’d be doing the out and back in a day. It’s actually just a couple hour trip to get over to the base of the Mt. Washington Auto Road from our place in Waterbury, so day tripping is certainly practical, but breaking up the driving with some camping has been the routine these past few seasons. I did a final check on the forecast for roughly the 5,500’ level on Mt. Washington this morning, and it called for leftover frost, clear skies, a high around 50 F, and light winds in the 10-15 MPH range. That’s an excellent forecast for some skiing in Mt. Washington’s alpine areas, and it’s good to jump at these sorts of days, because you never know what the next one will bring when it comes to the Mt. 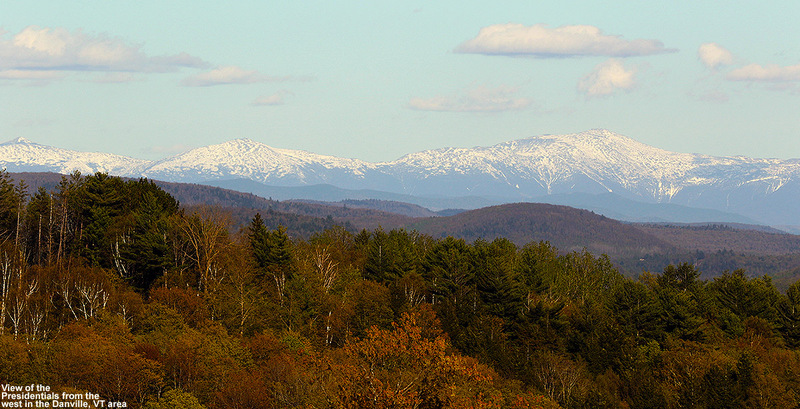 Washington and the Presidential Range. The boys and I headed out around 9:00 A.M. under blue skies and temperatures in the 60s F, and by midday we were up in the parking lot along the Nelson Crag Trail at ~5,700’ getting our gear together. 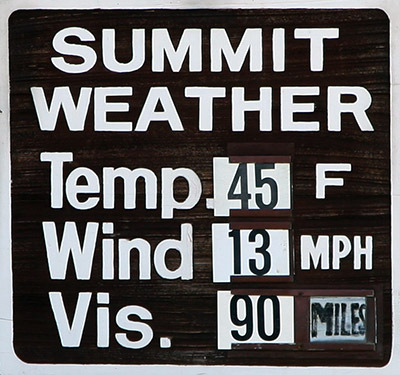 The weather was great, and the numbers on the board showing the summit weather conditions had been right in line with what the forecast suggested. After checking the images from the Ravines Cam over the past few days, as well as this morning, I could see that one of our favorite snowfield areas below Ball Crag was of decent size, so that was our planned destination. 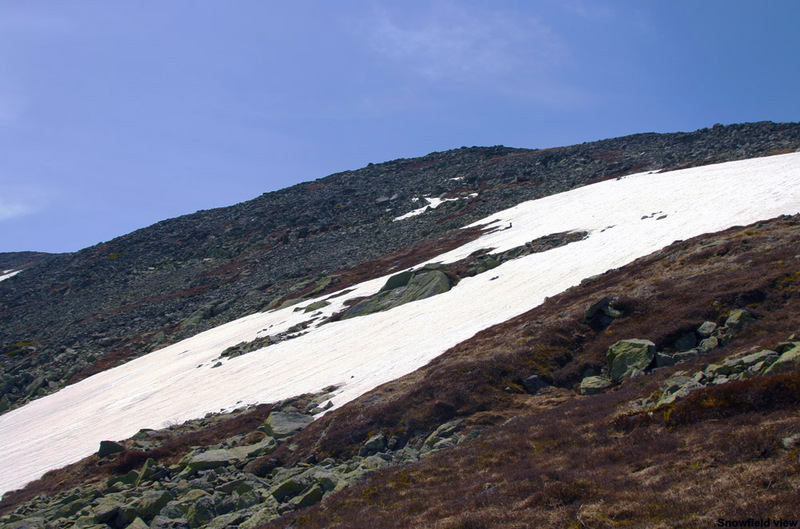 We like that Ball Crag snowfield because it doesn’t see nearly as many visitors as the main East Snowfields below the summit, and instead of having to park above it and hike down into the snow, you can contour right across from the parking area along the Nelson Crag Trail. It can be a bit harder to find some of those lower snowfields if you’re not familiar with the area, but we usually have good luck traversing out from near the junction of the Nelson Crag and Huntington Ravine Trails. Today the traverse out to the snowfield was incredibly quick – within 5 to 10 minutes (Ty says it was 7 minutes) we’d hit the snow. 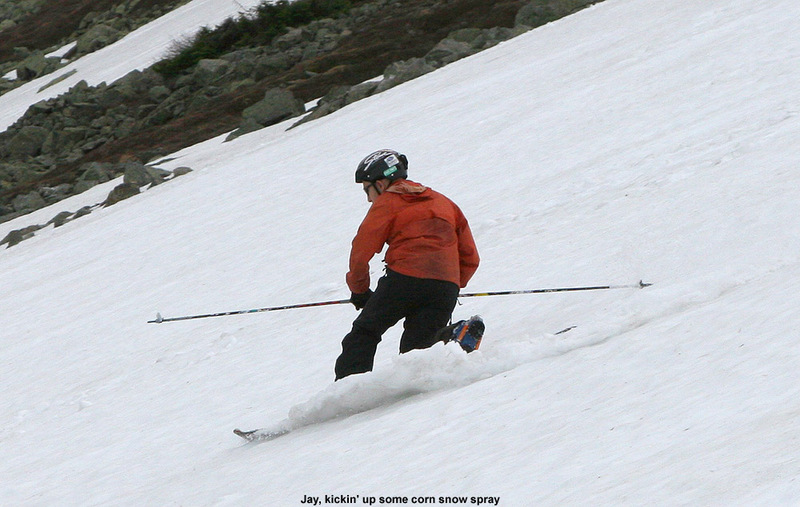 The snowfield was a totally clean slate of corn, with no traces of previous skier activity, so presumably nobody had skied it in a while. 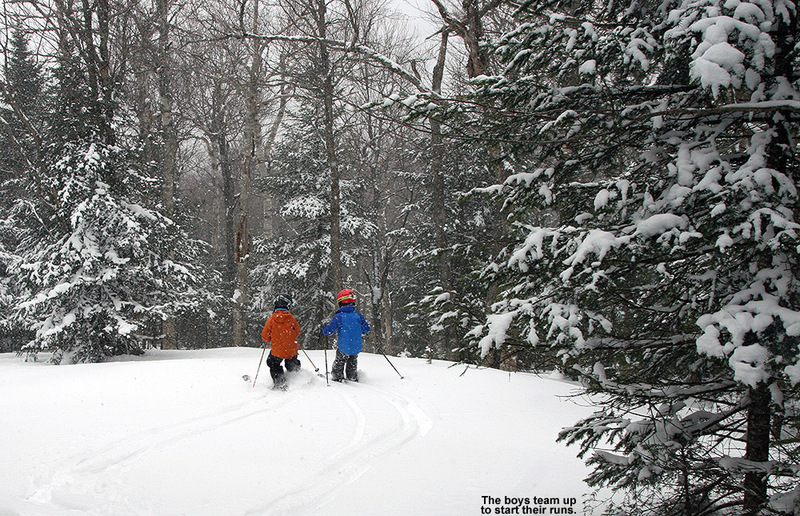 The scene was quiet when we arrived, but it wasn’t long before the boys started having fun with the snow and the activity level ramped up. The boys had a great attitude about the skiing today, certainly relative to some trips we’ve had, and although it was different since Mom wasn’t there, I think they enjoyed the “boy’s day out” sort of feel. 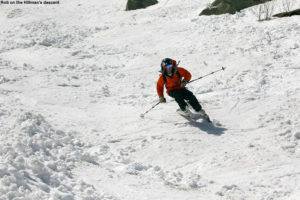 We made an initial ski descent of the snowfield, which seemed to provide somewhere in the range of 200 feet of vertical. It was a reasonably long run in which you could certainly get a groove going, and there were a lot of different options for skiing in the various nooks and crannies of the snowfield’s footprint. 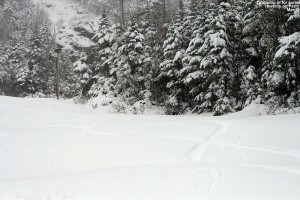 The snow was great, being a bit harder in a few spots, and a bit softer in others, but the bulk of it was just right for making turns. I told the boys that I’d bring their skis back up for them so that they could enjoy the hike, and strapped their skis on my pack along with mine. It actually wasn’t a bad pack load, and I think it helped to keep their spirits up. 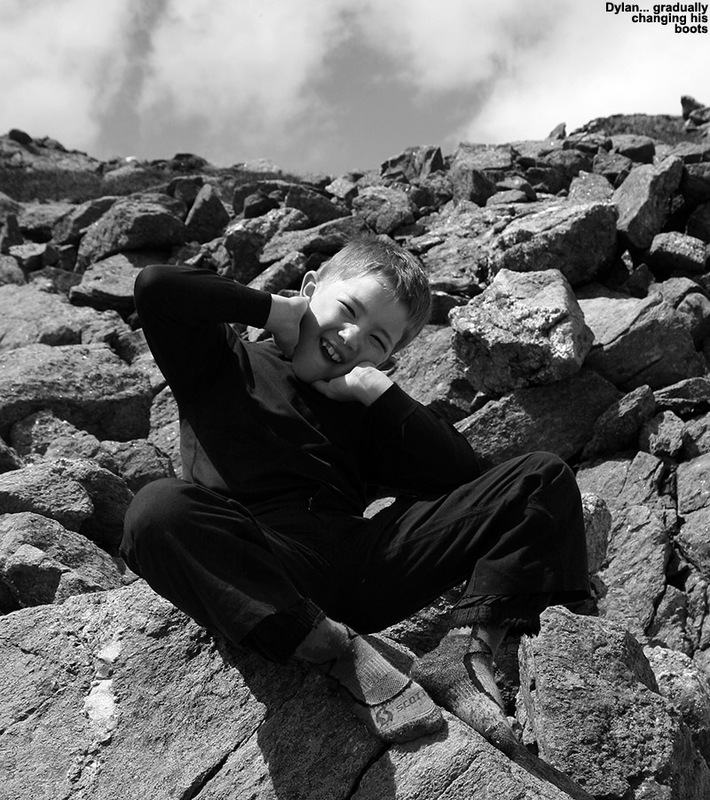 Back at the top of the snowfield, we had lunch, and the boys again played around in the snow for a while. There was just a bit of breeze at times, and bugs were virtually nonexistent, so it was a great day to be out on the snow. 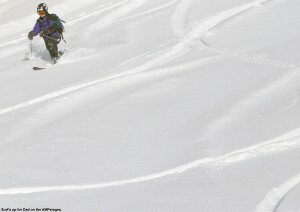 During our first run, a couple with a dog had arrived for some skiing, but they spent their time a little farther over on the snowfield, so we didn’t see them much. It was actually good that they had their own section in which to hang out, because Ty and Dylan were a bit boisterous in their play, and that way the boys weren’t too loud in their immediate vicinity. For our last run we decided to run out the snowfield to the bottom, then contour back over to the Huntington Ravine Trail and take that right back up to the car. That hike took a bit longer since we were starting out lower in elevation, but I’d say within roughly 15 minutes we were back at the parking area. The boys still played around a lot today, so that took up plenty of the afternoon, but this has to be our most efficient outing in terms of the hiking. 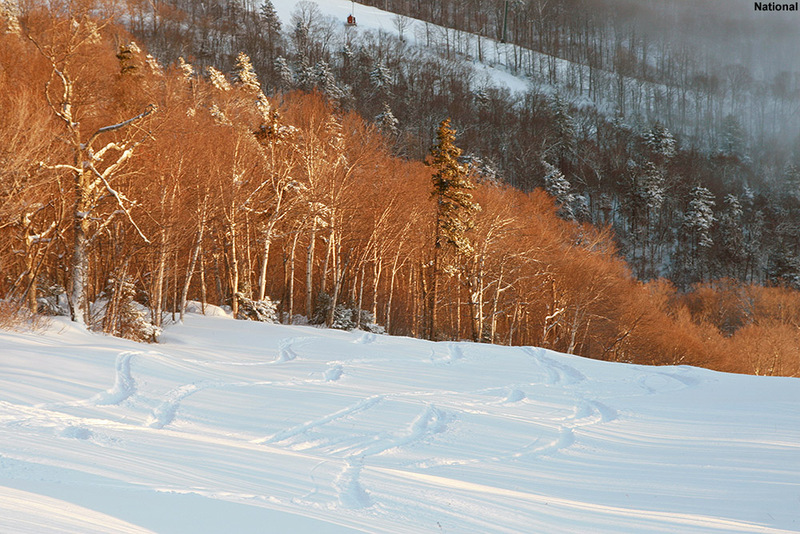 The snow will likely be around for a bit longer based on what we saw, so there should be snowfield turns available for those that are interested as we move forward in June. Using the Auto Road to gain access to Mt. 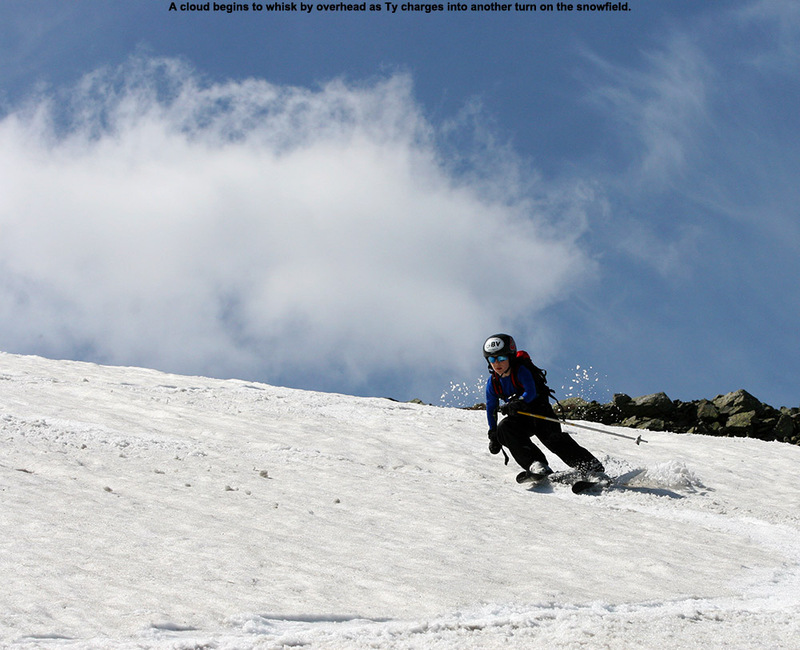 Washington’s East Snowfields is a convenient way to get to some fantastic spring skiing, but a number of factors need to align for an optimal outing to come together. First, the road has to open. One never knows exactly when that’s going to happen, since it depends on how much snow has to be removed, how fast it’s melting, how much road maintenance needs to be done, how often bad weather delays work, etc. Then, even once the road is open, weather can still play a factor. Although some folks might be inclined to head up into the alpine regardless of the forecast, I think most folks would agree that a calm, warm, clear spring day (or at least as close as you can get to that ideal) is the way to go. Those types of days can be rare on Mt. Washington, but they certainly happen, and they typically occur more frequently the farther one gets into late spring. 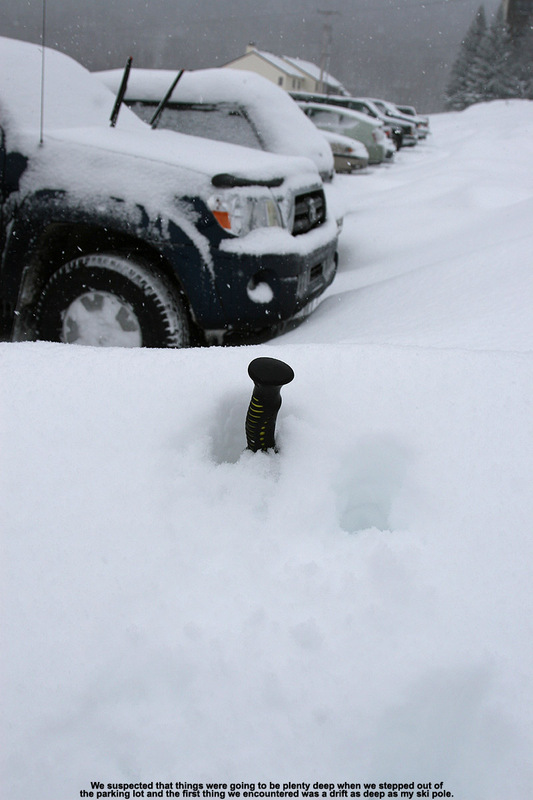 While time might be on your side with regard to weather, it’s generally not on your side when it comes to snowpack. 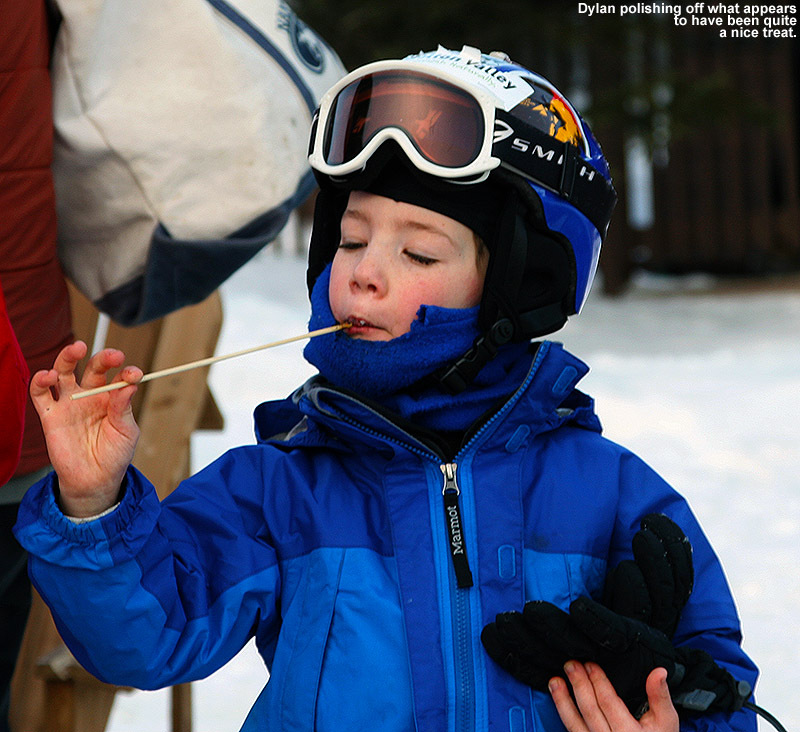 With each passing day of warmth, the snowpack melts a little more, and ski options diminish. 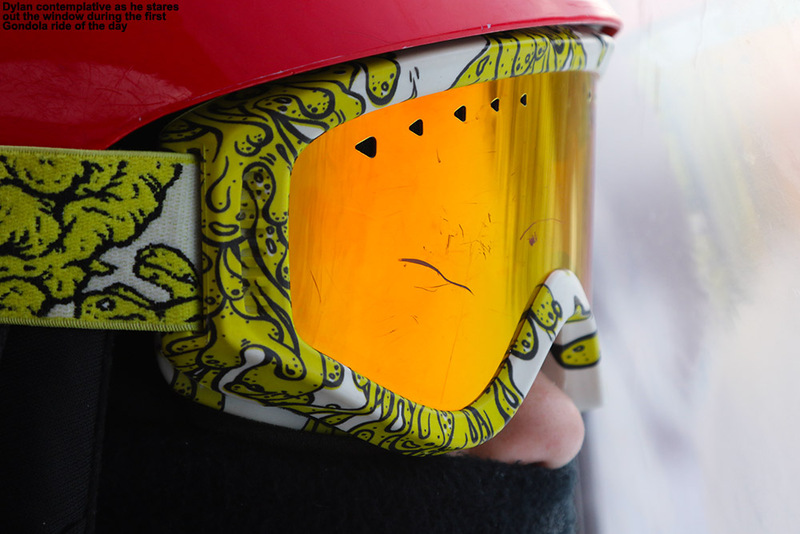 And, even if the stars align to create that perfect combination of access, weather and snowpack on the mountain, there’s everything else in life that has the potential to get in the way of letting you jump at the opportunity. 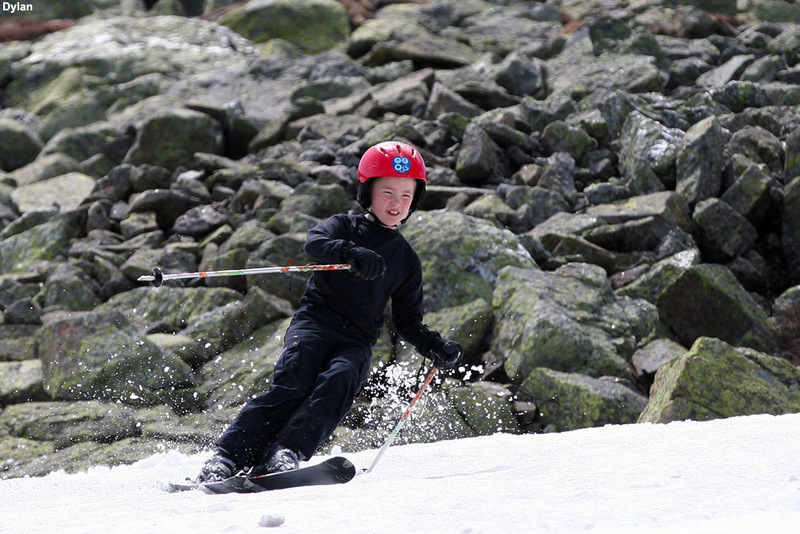 Once in a while, things just don’t come together before the snow melts, but somehow, even with all those obstacles, we usually manage to get over to New Hampshire for some spring camping and skiing with the boys, and this year was no exception. For two weeks from the end of April through to the second week of May, we saw an incredible stretch of clear, warm spring weather with absolutely no measurable precipitation at our house in Waterbury. 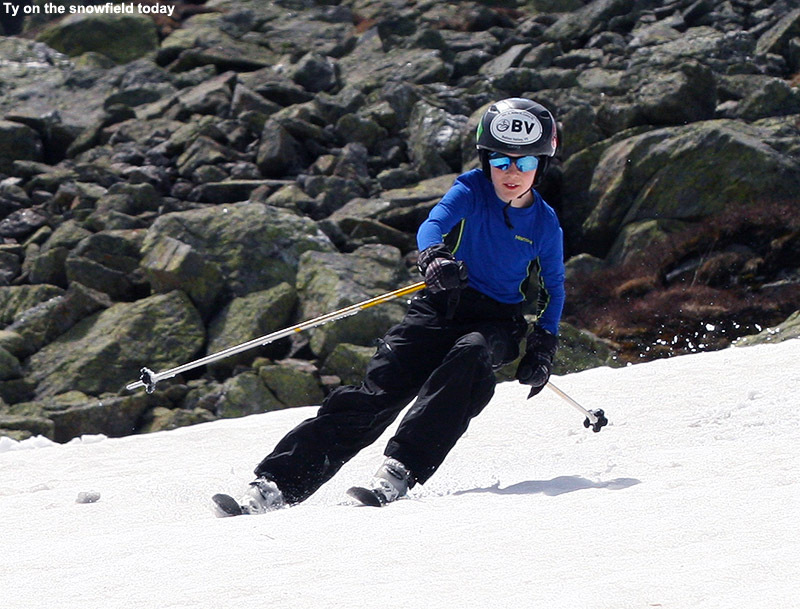 This period produced some great spring skiing, but the warmth and sun also accelerated the snowmelt to a rate that was a bit faster than usual. 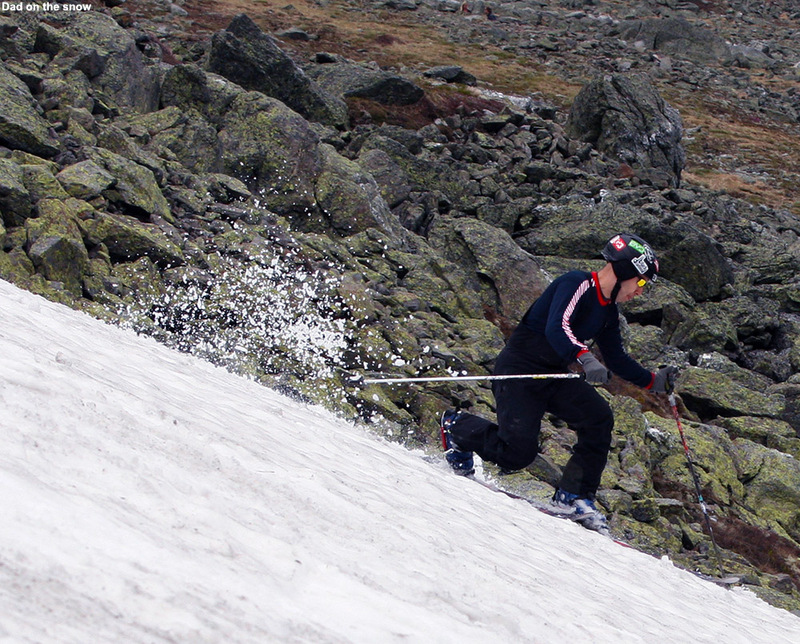 This period was great in terms of progress on clearing snow from the Mt. Washington Auto Road however, and it was open to the summit as of last weekend. The weather was unsettled for that first weekend though, so we opted to head down to the South Shore area and visit Erica’s mom for Mother’s Day, and keep our eyes peeled for a good weather window. After a couple more days of unsettled weather, the clear regime returned this week, and prospects for an Auto Road trip were looking excellent. This morning, the forecast called for decent weather with temperatures in the 40s F, and the morning shot from the Ravines Cam revealed crystal clear skies. 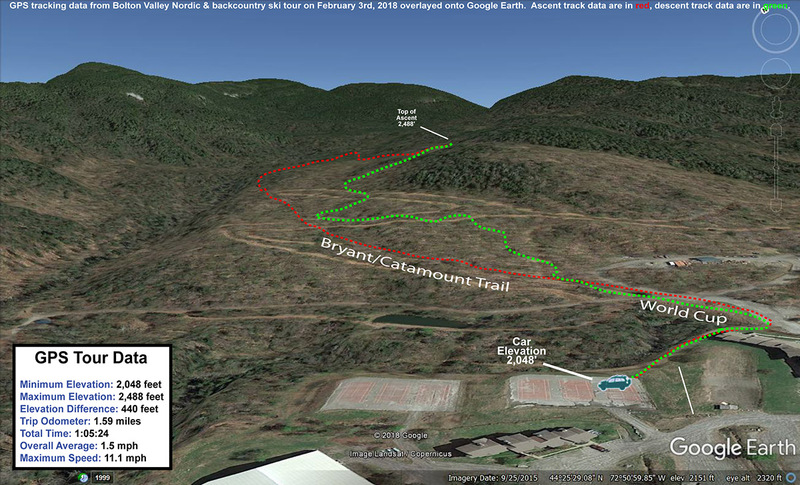 It also showed that the east side ski options below the Mt. 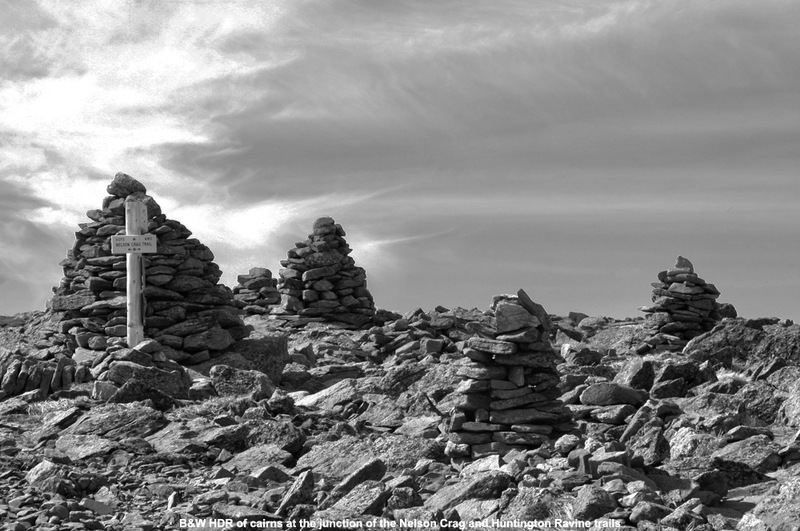 Washington summit are still quite plentiful, with many additional snowfields available along with the main one. 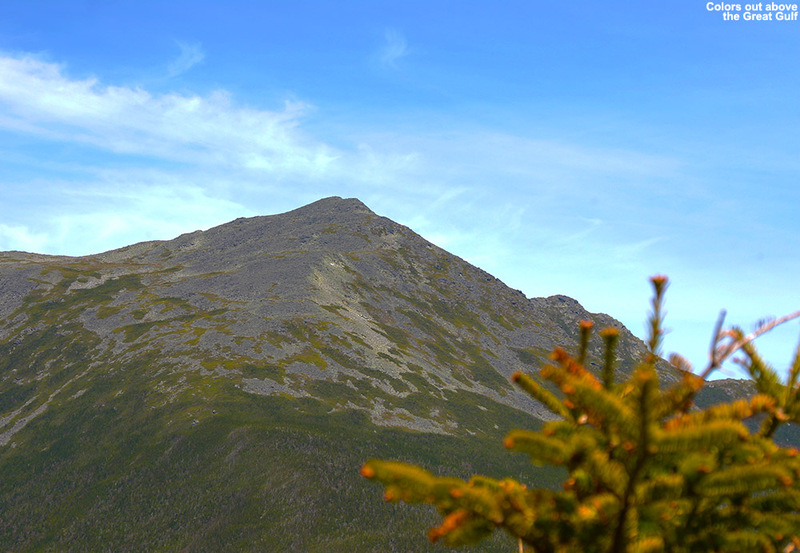 We were on our way to the mountain by mid morning, and views from the west side were already encouraging as we approached the Presidentials. 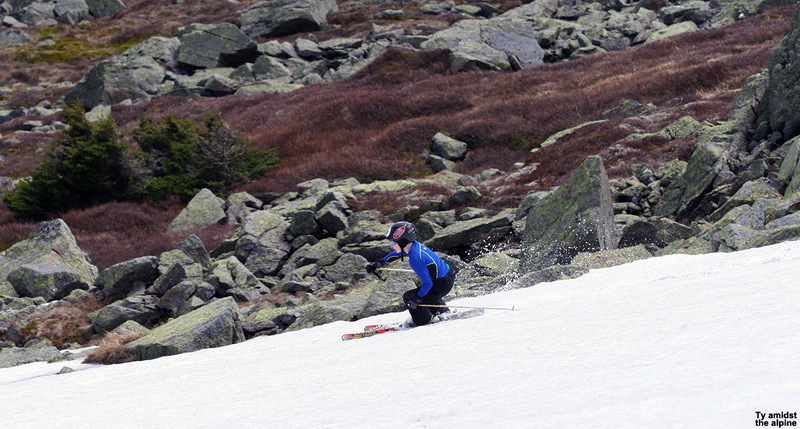 When the west side still has skiable snow, you know the east side is going to have plenty of options. 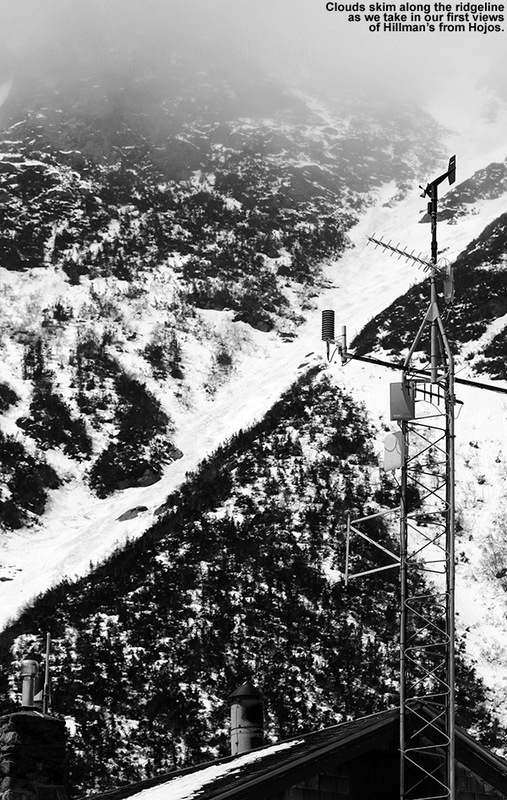 Steep lines with decent snow were even visible on the north side of the range as we passed by on Route 2, and on the ascent of the Auto Road we could see various snowfields in the peaks towering above the Great Gulf. 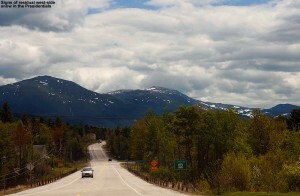 In the proximity of the Auto Road itself, the first signs of snow were at roughly the 3,500’ elevation. 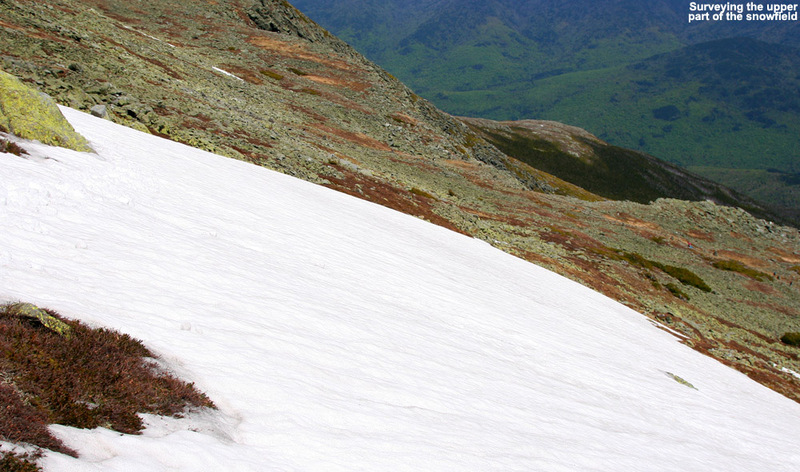 As for the East Snowfields, the setup today was a lot like we encountered during our 2010 trip, in that the broad strip of snowfields was present off to the north of the main East Snowfield. A look at the availability of snow in 2010 shows an interesting distribution of snow – that strip of snowfields off to the north was very prominent, and the main East Snowfield was surprisingly small. 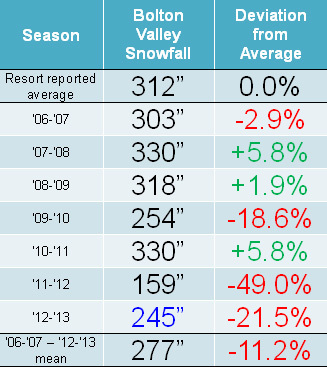 The current snowpack is definitely different from what we had available on our 2011 and 2012 trips, where the skiing was essentially down to just the main snowfield. With the lower snowfields in action, we decided to go with the approach applied in our 2010 trip, which is to use the parking area below the 7-mile post on the road, instead of the parking area at the top of the snowfields. 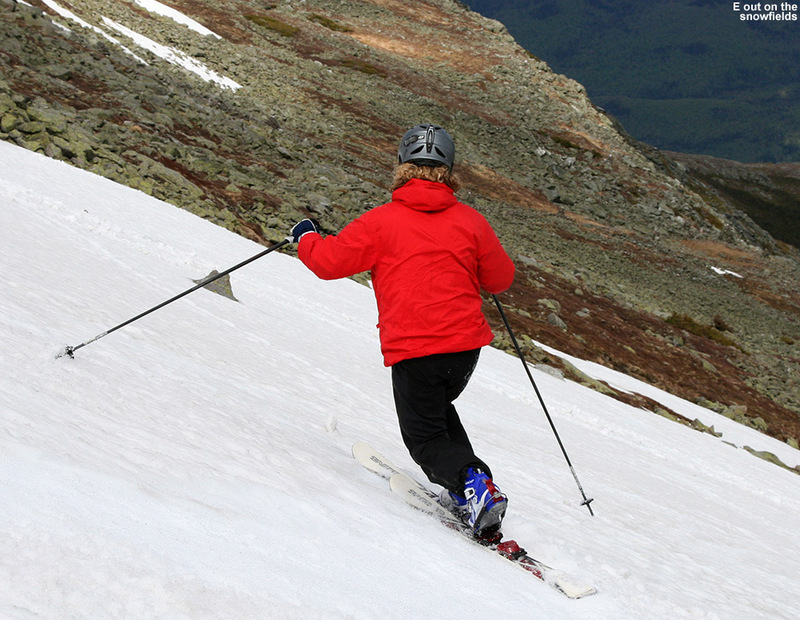 Using this technique, one can tour out along the more northerly snowfields as far as they want, even hitting the main East Snowfield if they’d like. 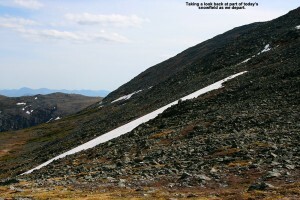 Then, to finish the tour, instead of having to hike back up to the parking area atop the East Snowfield, one can essentially traverse back along the base of the snowfields with minimal additional ascent. 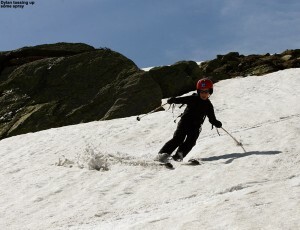 Along the way, you can make descents in the other snowfields as well, which often have untouched snow. They’re used much less than the main East Snowfield and we’ve typically found that we have them to ourselves with untouched corn snow. At the end of our 2010 trip, we also discovered a very efficient use of the mountain’s hiking trail network for this type of tour. We’ve started traversing on the Nelson Crag Trail before, but, it turns out that simply descending straight down from the lower parking area on the Huntington Ravine Trail drops you right onto the northern edge of the snowfields, so you can use the trail to get you right to the snow. You can’t really see the snow from above, so it’s not obvious unless you know what you’re doing, but as long as those northerly extensions of the snowfield are present, it’s a really sweet and efficient approach. 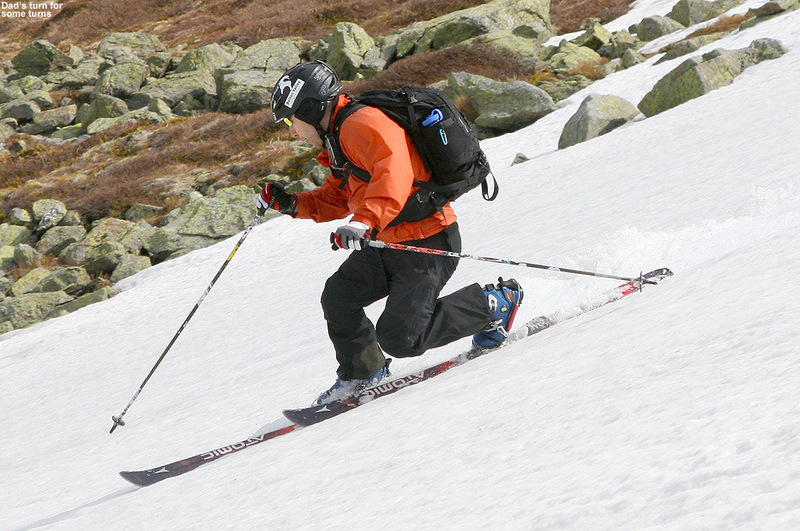 Even though the distribution of the snow in the snowfields area is different each spring, it’s nice to be developing a knowledge of what works well for getting to the snow. 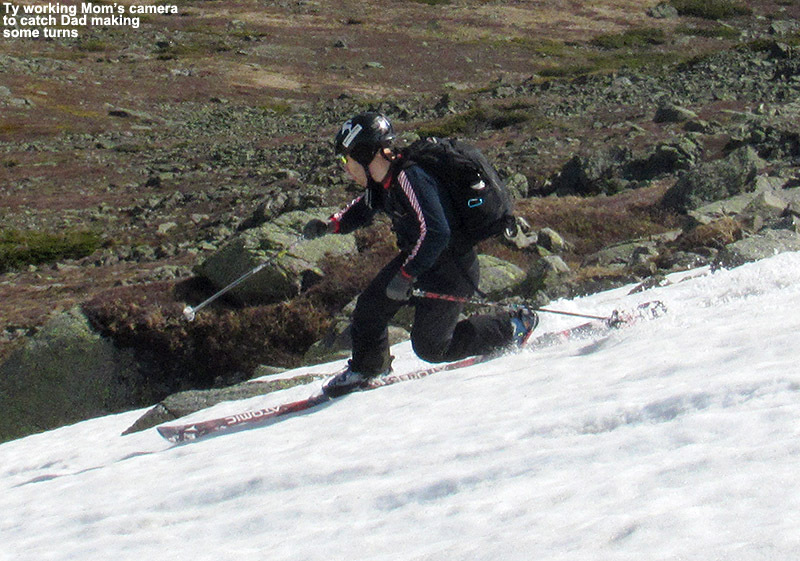 We’re definitely starting to dial in a good understanding of how to best approach what we see on the Ravines Cam in terms of touring the snowfields. This year our goal was to tour out toward the main East Snowfield as described above, with the potential to ski there, but it would depend on how good the skiing was that found along the way, as well as time, and of course the boy’s attitude and morale, which can be extremely flighty on these outings. As expected, taking the Huntington Ravine Trail got us to the snow in just a few minutes of hiking from the car, and Ty and Dylan were ready to just stop right there and start skiing. E and I explained to them that what they saw was just the tip of the iceberg in terms of snow, and that we would be traversing southward for some longer lines. The snowfield there was only about 50 vertical feet or so, but typically the priority for the boys is to minimize the amount of hiking they have to do in whatever way they can. 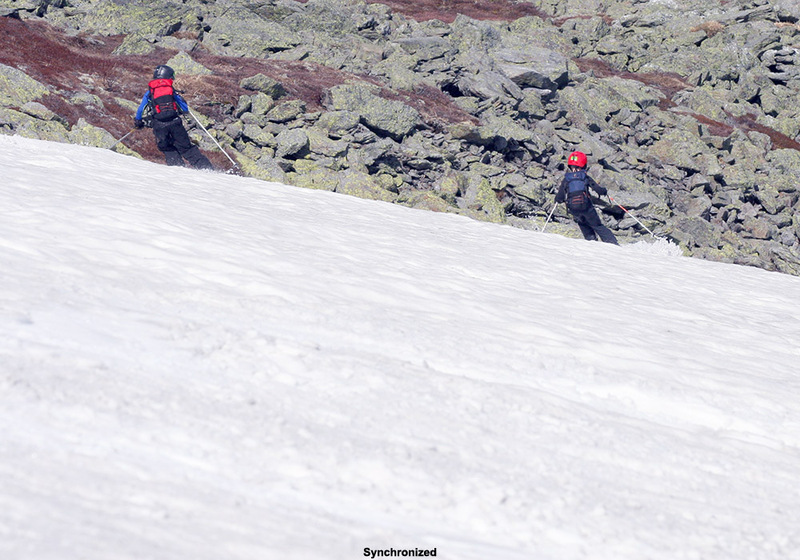 The boys did have a bit more challenge this year, since they were both carrying their own skis on their packs for the first time. 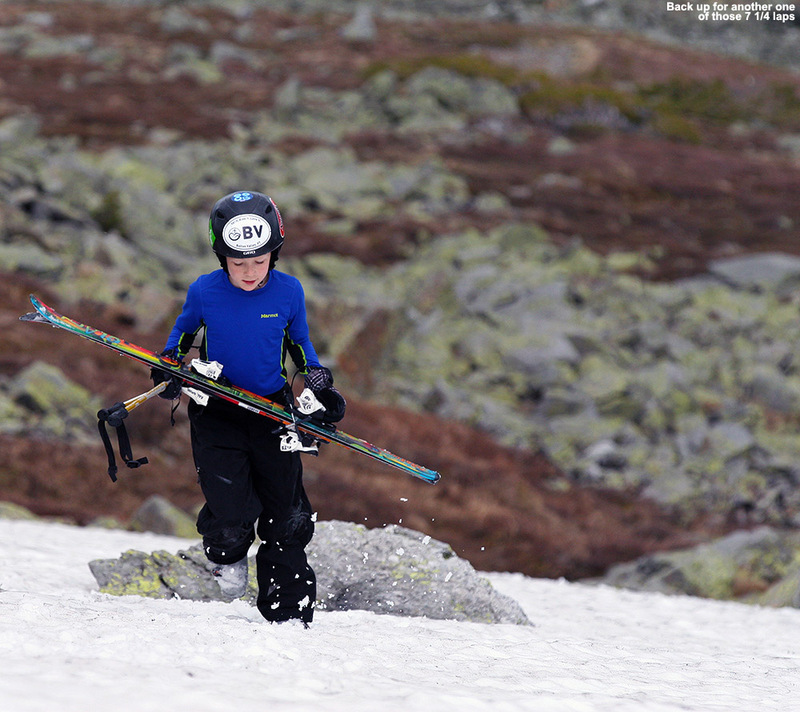 Fortunately, they had both decided to use their Telemark skis, also a first for them, so it’s nice that their Teles are lighter than their alpines. This also meant that they could simply wear their Telemark boots and hike like me and Erica in ours, since they are very flexible and have rubber soles. This meant we didn’t have any alpine boots to carry, although Tele boots still aren’t quite as easy for hiking as standard hiking boots, so that was a bit of a bump in challenge for the boys. 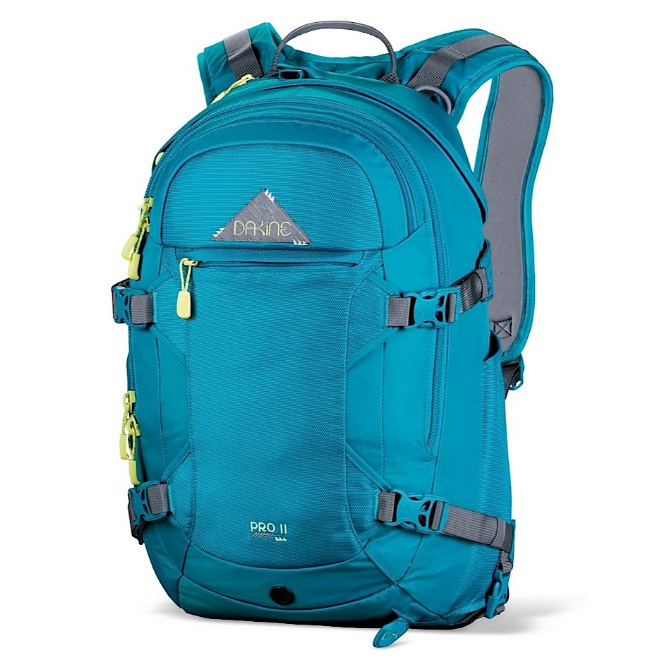 For E, this trip was also a chance to carry her skis on the Dakine Women’s Pro II 26L ski pack that she got for Christmas. 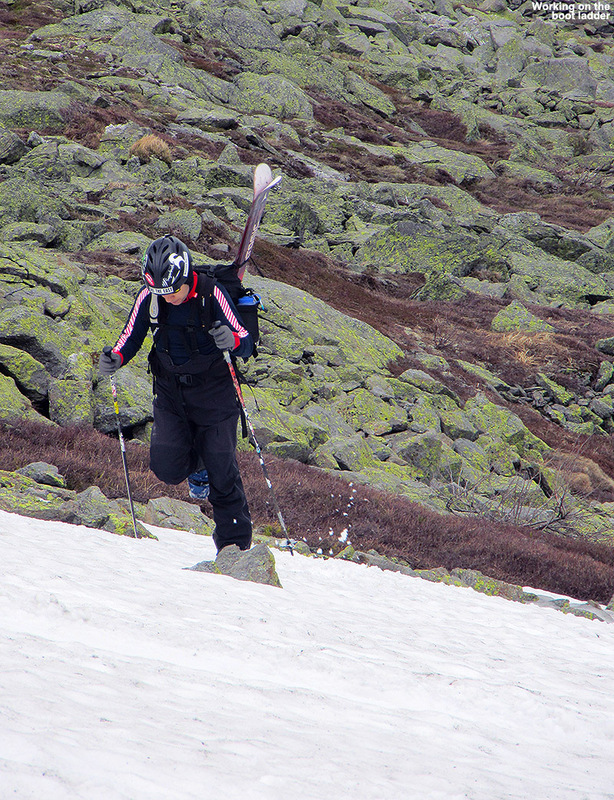 Although she used it on some backcountry outings this winter, we were always skinning, so there was no need to carry her skis on her back. This was her first opportunity to really put it to the test with skis on it, and she was very impressed. 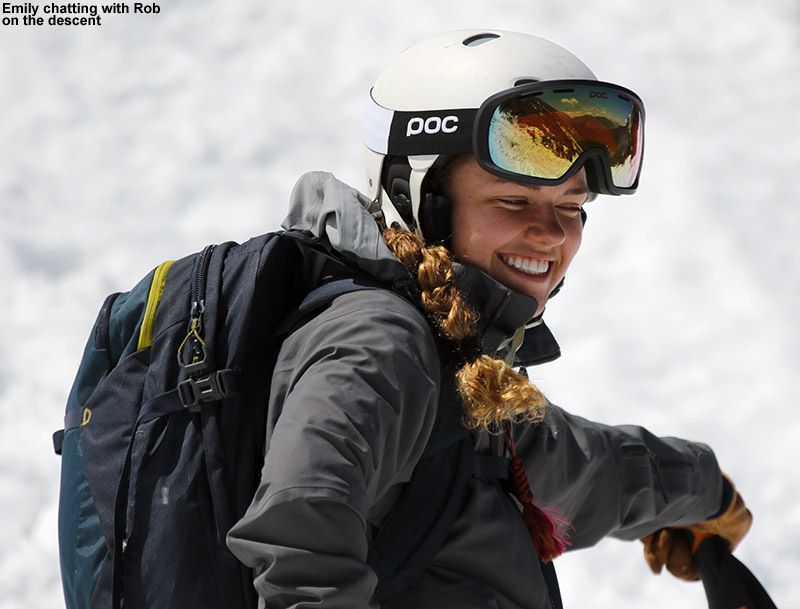 I wouldn’t have thought about it, except that she commented on how it didn’t even feel like she had skis on her back – that’s always good sign when it comes to a ski pack. 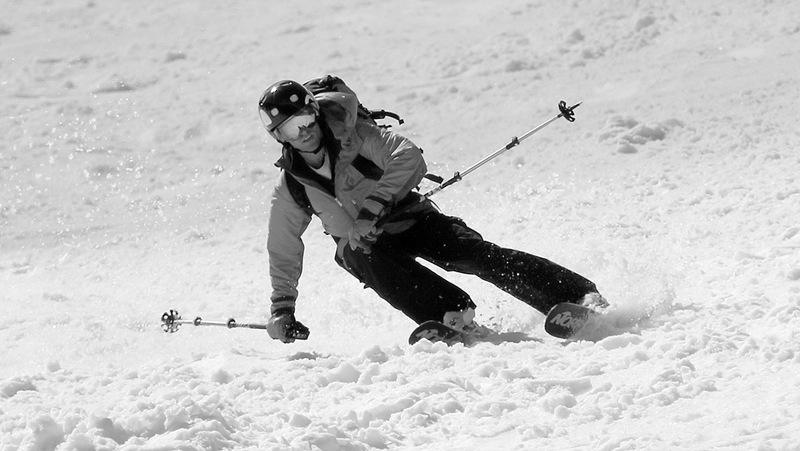 She also mentioned how the diagonal carry is so superior to the A-frame style carry in terms hitting the backs of the skis with your legs. I’ve always been very impressed with the diagonal carry on my Dakine Sequence ski/photo pack, so I’m glad E is getting to make use of that system. 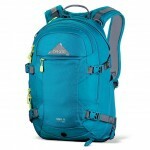 Dakine definitely knows how to set up a ski carry system. 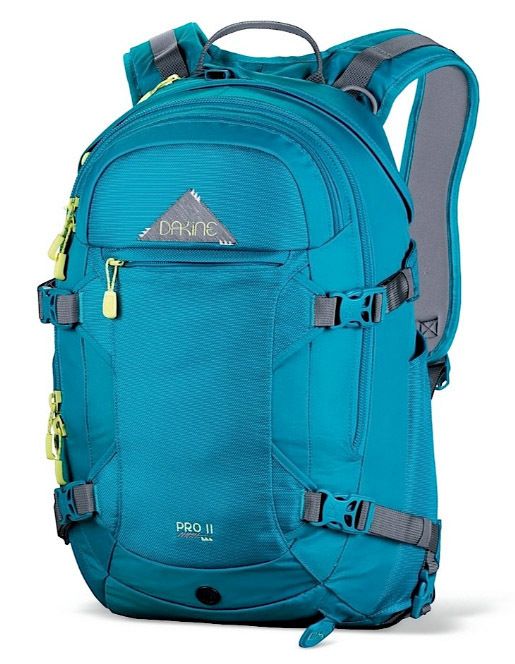 The one issue I did notice with E’s pack is that since it has a helmet carrying system (very cook and I wish I had one) it gets a bit tight when the skis are on there in diagonal carry as well. 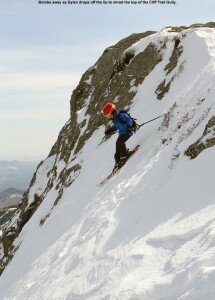 Overall the skis and helmet were nice and snug there though, and E had no complaints. Our only lament heading outbound on the tour was that with our skis angled down to the right, it meant that they occasionally touched the rocks because of the direction of the side slope on our southward traverse. It was only an occasional inconvenience though, and I joked that we could always traverse around the entire Mt. Washington summit cone in the other direction if we really wanted to avoid that issue ;). 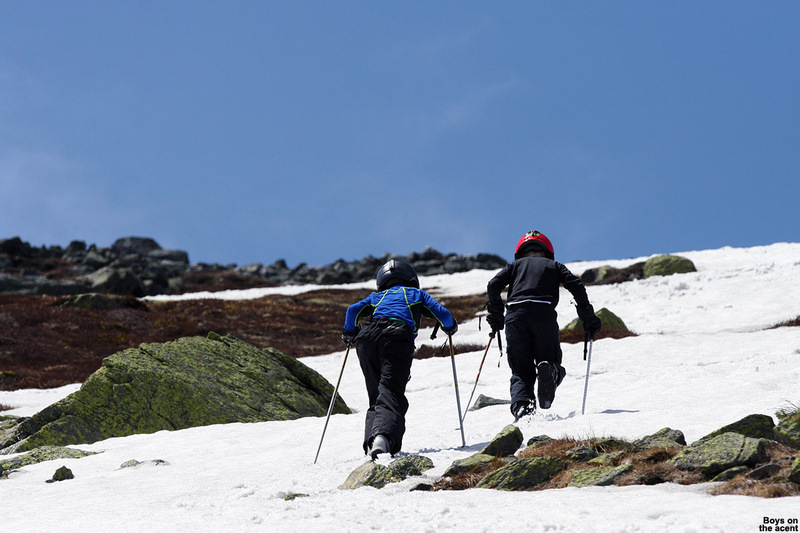 After only about ten minutes of southward traversing, we came to a substantial snowfield of about 250’ vertical or so, and we decided to do some skiing. 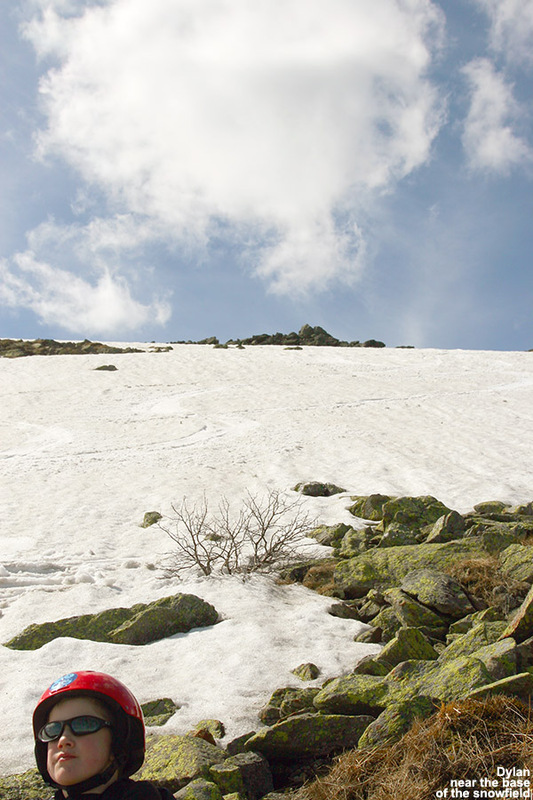 We hit the snowfield about midway up, so I set in a boot ladder to the top. 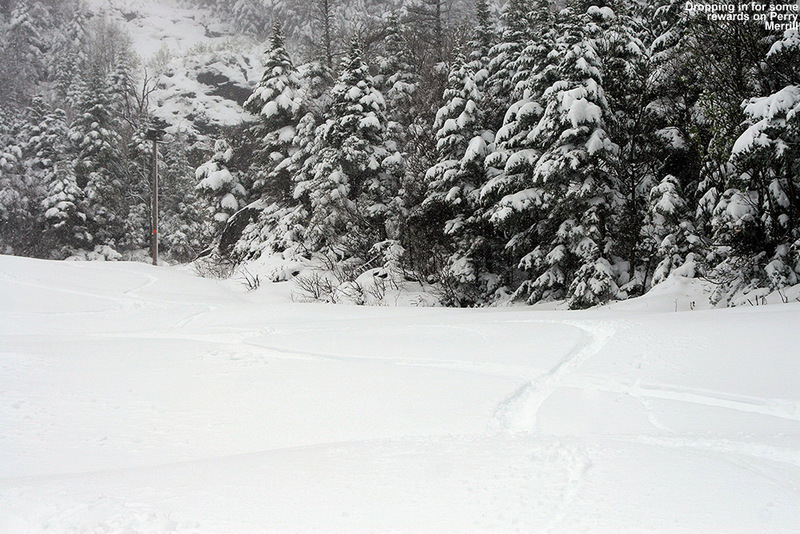 The snowfield held beautifully flat and pristine corn snow, aside from a couple of very faint tracks from a previous skier or two that must have been there quite a while ago. 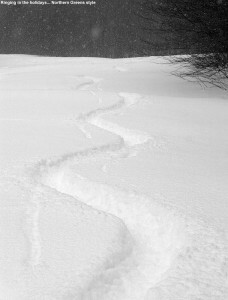 The snowfield was continuous, but did have a choke point about midway down along the left, so one had to take that route. 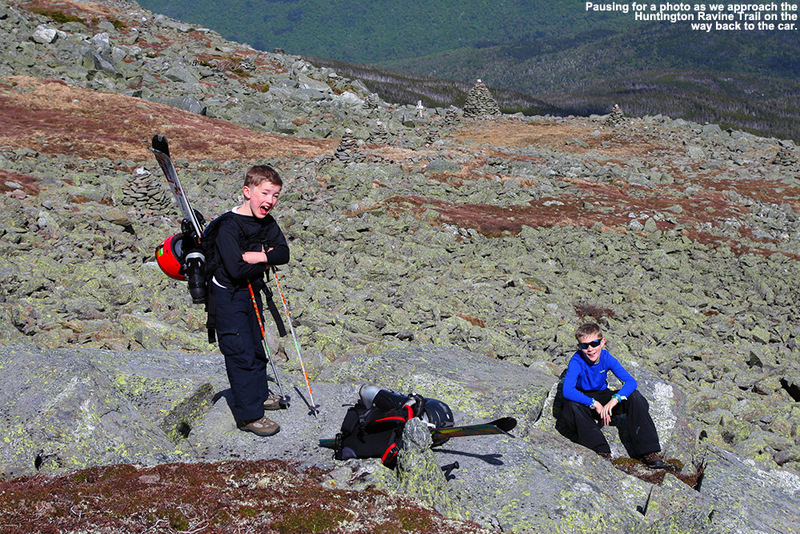 It was good that we’d reached at least an initial snowfield, because the boys were already getting grumpy. 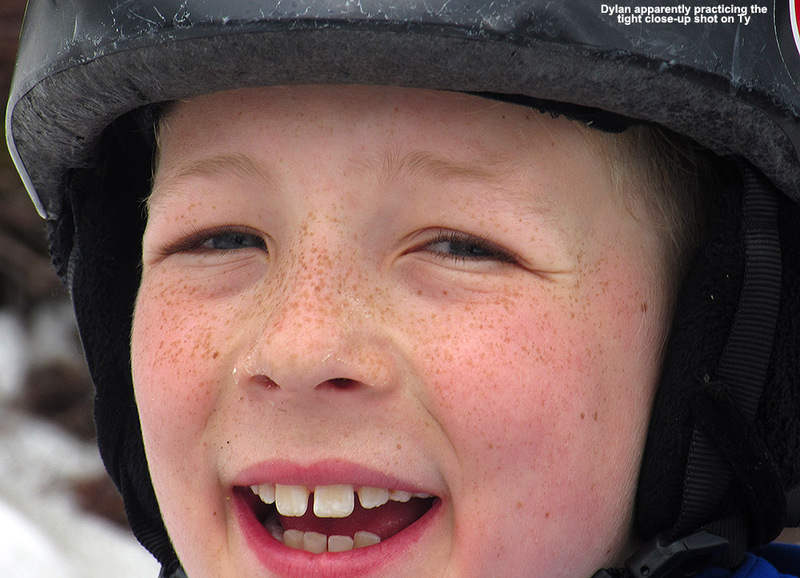 They really wanted to get on with the camping, and while they enjoy being out on the snow, getting them to thoroughly relish all aspects of earned turns is always a challenge. Some days they enjoy the experience, or at least substantial parts of it, but other times it’s essentially putting up with Mom and Dad dragging them around to these snowy spots. 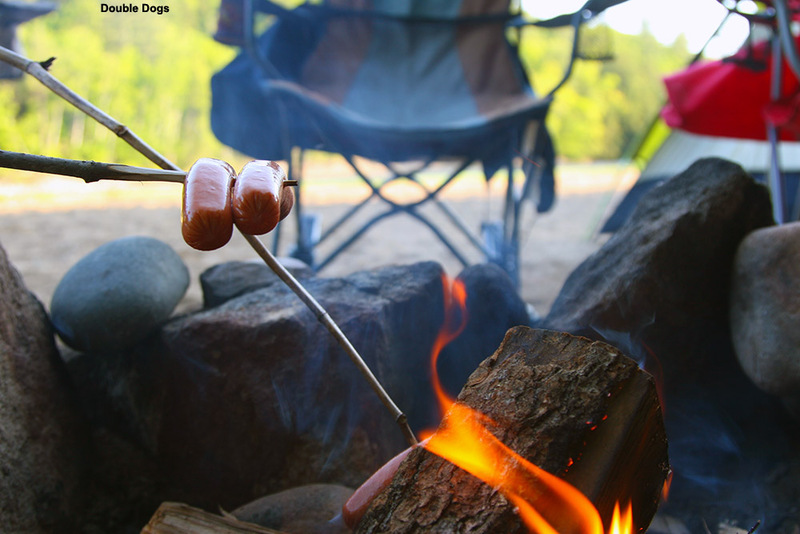 We’ve learned that it’s good to have a “carrot” aspect of the trip as well, whether it’s a stop in a the Bryant Cabin on a Bolton Valley Backcountry Network outing or the swimming pool after, a chance to eat out somewhere once we’re done, or in this case, a chance to do some camping. We relayed to them that they were sitting on their own private snowfield with great temperatures, no wind, no bugs, beautiful snow, and even some sunshine. These aren’t things that you can get every day, but in their minds they were already off the mountain and down by the tent and campfire. 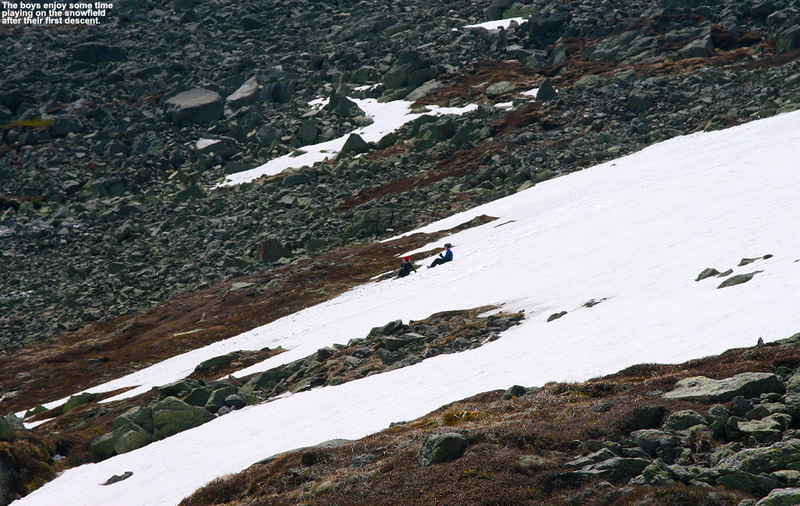 At the top of the snowfield, I hung out for a while and enjoyed the scene, while the boys did a bit of sliding on the snowfield, and E made the first descent. 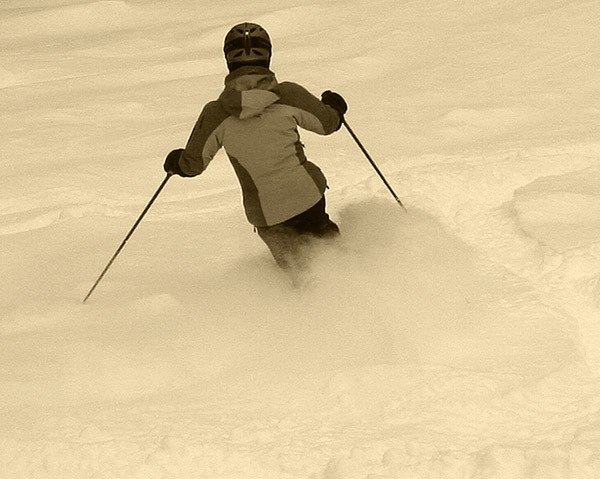 Her turns looked good, and it was amazing how fast she dropped that vertical. 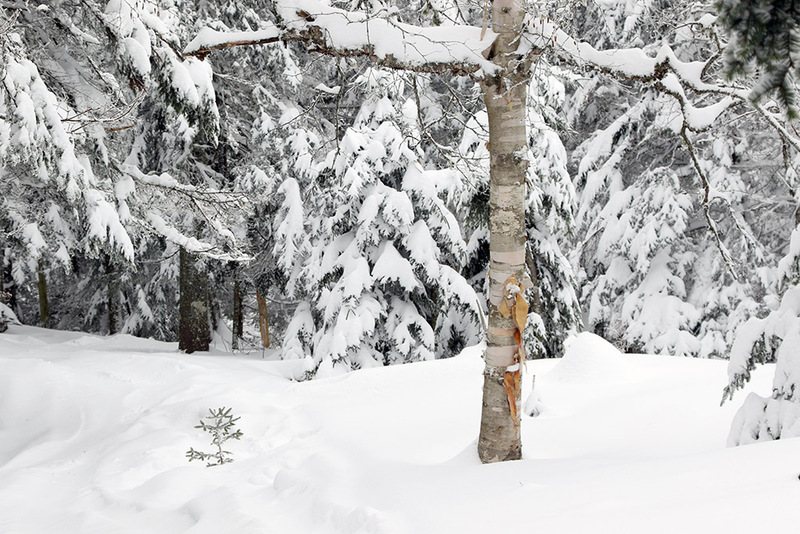 It seemed like she was down toward the flats of the Alpine Garden area in an instant, and she looked so far away. I skied a run next, and then we eventually got the boys to make some turns, even though they were being somewhat lazy and reluctant. 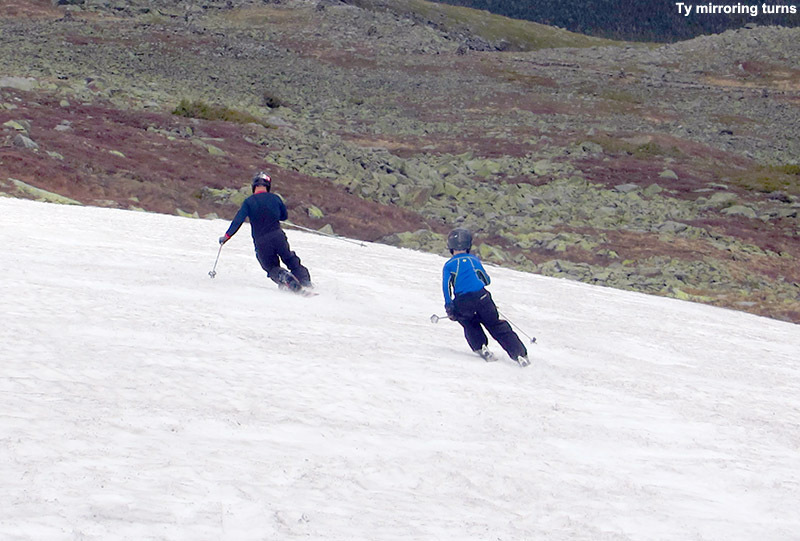 They both put together some nice Telemark turns, even though the pitch of the snowfield was quite steep. E and I both made some additional turns, with me finishing off a run on the lower right of the snowfield while E shot some pictures. 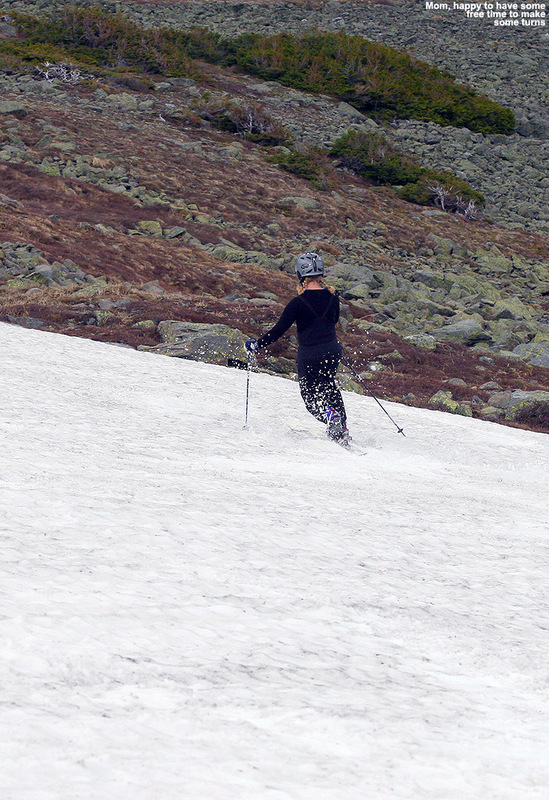 We had the snowfield to ourselves the entire afternoon, so even though it was only about half the vertical of what was available on the main East Snowfield, it was such good skiing that we never even continued over there. The boys were a bit too sour for that anyway, and really wanted to get on to the camping. We could hear that occasional shout from people on the main snowfield though, and I’m sure there were some great times going on over there. 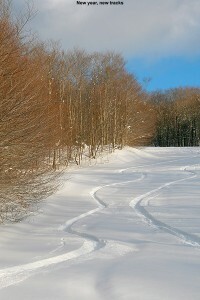 The return traverse to the car was pretty quick, and E and I helped out the boys by each carrying a pair of their skis. For the extra set of skis, we went with a vertical carry, and E seemed to still be impressed with the stability and ease of her pack, even with the second set of skis on it. I made the lowest traverse, so that meant a few minutes of hiking back up the Huntington Ravine Trail at the end, but I was eager to test that out. It was nice to walk on an established trail, since the going was a big quicker than across the random jumbles of rocks that give the Rock Pile its name. 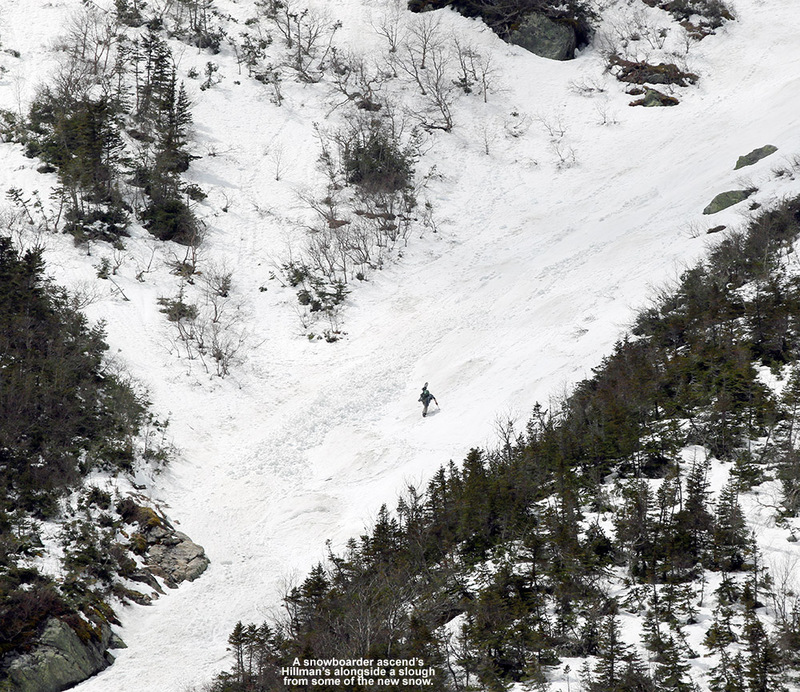 While we were loading up the gear at the parking area, we had some inquiries about where we’d been skiing, and one guy was very intrigued to know that you could access the snowfield from that lower parking lot. He said he’d like to try it out in the future. 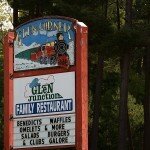 Each year we like to try out a new campground on our visit to the snowfields, and this year I decided that we’d head south to Glen, New Hampshire. I’d found a couple of potential campgrounds there. The first was the Green Meadow Camping Area, but when we stopped in and found out that they weren’t opening until next weekend, we headed to the Glen Ellis Family Campground a couple of miles down the road. I’d put it as the second choice because it was a bit more expensive, but once we got there you could immediately tell why. The grounds are immaculate, and the building that functions as the main office and store was a beautiful building. Everything was first rate, and they’ve got a huge playground, basketball and tennis courts, and even a pristine baseball diamond. It’s certainly in that upper echelon of campgrounds. Visitation was only modest since it’s no Memorial Day yet, so they gave us one of the riverside campsites. We thought that would be nice, but it wasn’t until we finally got to it that was saw how amazing it was – it was absolutely one of the coolest campsites we’ve ever had in either to Eastern or Western U.S. There’s a wooded section with the usual fire ring, picnic table, etc., but then that expands up onto a riverside area comprised of the rocks that are part of the riverbed, with a second fire ring. 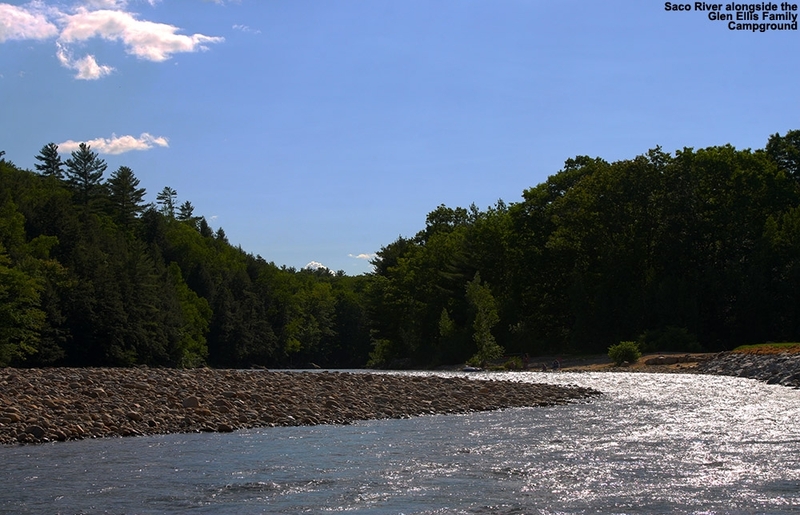 It overlooks a gorgeous stretch of the Saco River that made E and I feel like we were back in Jasper National Park. As soon as we saw that riverside section, we knew we were going to pitch our tent right up there. The boys headed off to the playground for a bit, we cooked up some hot dogs and beans for dinner, and finished things off with s’mores and lot of campfire time. There wasn’t actually anyone else camping out on the river since campground visitation was light, but I have to believe those riverside spots are pretty coveted on busy weekend. The fly fishing looked amazing, and we saw one guy out working the stream about a half mile downstream. That is a campsite that will not soon be forgotten, and it will definitely be on our list for the next time we’re in the area. Apparently their Laundromat is a big deal as well, because there are as many signs for that as there are for the campground itself! Sunday update: The evening sky had some on and off broken clouds and a nice moon, and I bet it dropped into the 30s F overnight because even with the rain fly on the tent, we were down to the mid 40’s F. After breaking camp, we decided to try out one of the local restaurants for breakfast on the way home, and found the Glen Junction Family Restaurant. It definitely seemed to be the hot spot for breakfast, and the menu was almost overwhelming with the variety of combinations of fresh toast, omelets, and most of the usual morning fare that you can think of. Not surprisingly with the junction location, the theme is trains, and they’ve got some fairly large-scale trains that circulate around the rooms up near the ceiling. The boys definitely enjoyed watching those, as did the numerous children that were there as well – especially the younger ones. Of course any adults like me would enjoy them as well. One of the specials had eggs Benedict on French toast, which was tempting, although I ended up making my own omelet which contained corned beef hash and spinach. The waitress said that was the first time she’d ever had anyone put together that specific combination, and it turned out great. Everyone liked their fare, and we even had some extra to take home as the portions are plentiful. We got home today around noontime, after a bit of maintenance on the mowers, I was able to do the first lawn mowing of the season. It’s only about four short months until I’ll be on the last mowing of the season, and we’ll be thinking about the first snows, but there are plenty of summer activities to do in the meantime. 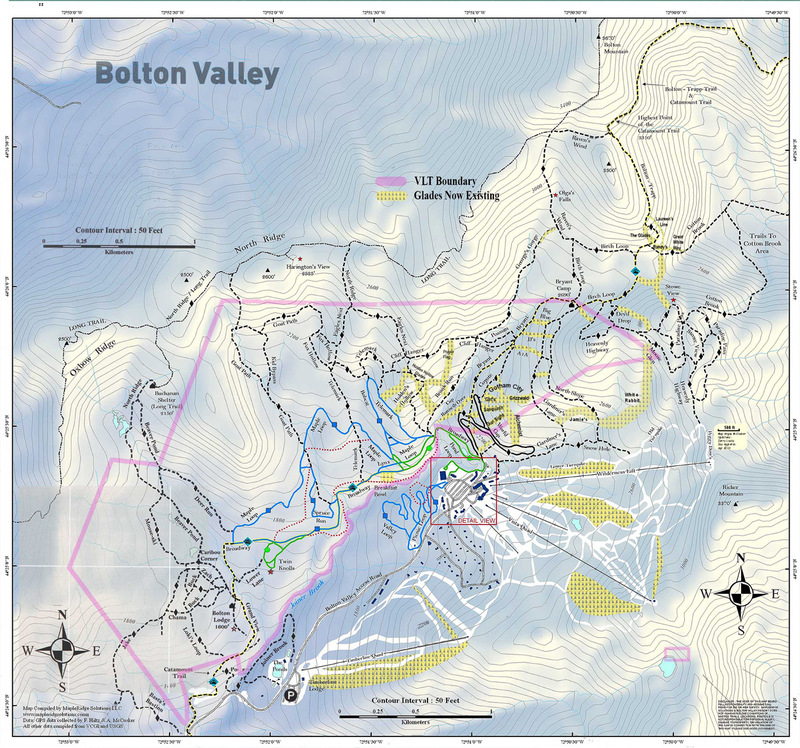 In terms of skiing, we’ll have to see if we want to take a trip down to Killington for some turns in the next couple of weeks, since they’re apparently going for June this year just like old times. Since it’s the end of August, it probably shouldn’t be that surprising that autumn-like weather is touching the Northeastern U.S., with freezing and sub-freezing temperatures hitting some of the usual cold spots. These days often sneak up on us though amidst the typically pleasant weather at the end of summer. 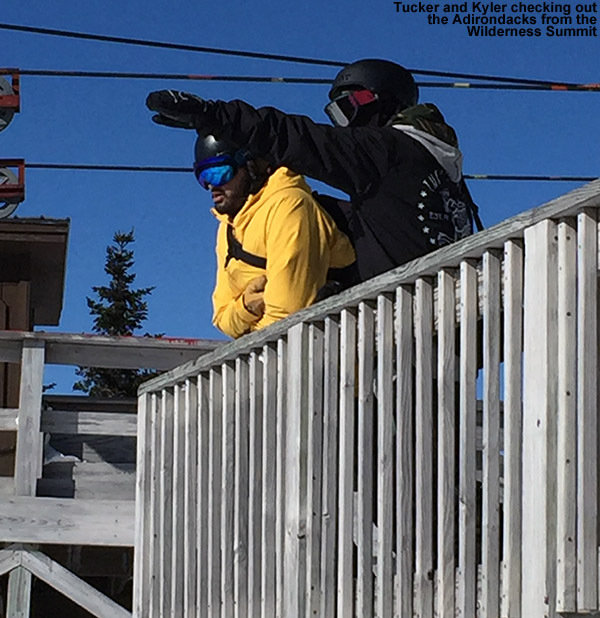 I saw a comment in the Signs of the Season thread at AlpineZone that Mt. 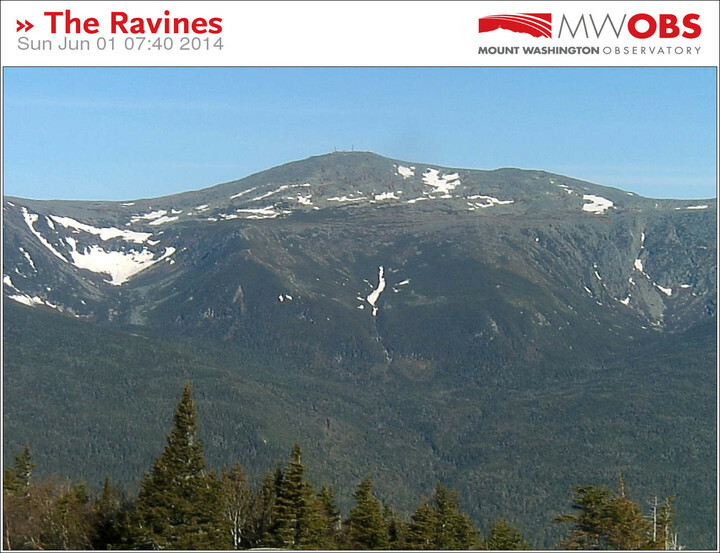 Washington in New Hampshire was below freezing last night, and indeed the Mt. Washington website confirms this. After a quick look through the August data in their archive, it appears that it was the first time this month, so perhaps it is a sign of the season. It’s the end of August, and Saturday is September though, so presumably it must be about time for sub-freezing temperatures on the rockpile. 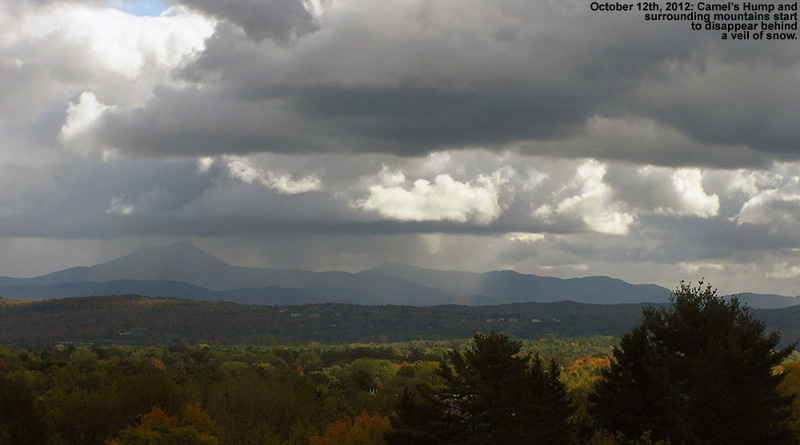 Down at more modest elevations, Saranac Lake also touched 32 F last night. As part of the discussion in the Northern New England Summer thread at American Weather, Powderfreak posted a plot with first dates of freezing for some of the cold spots in the forecast area for the National Weather Service Office in Burlington, Vermont.